Hello We R fans! 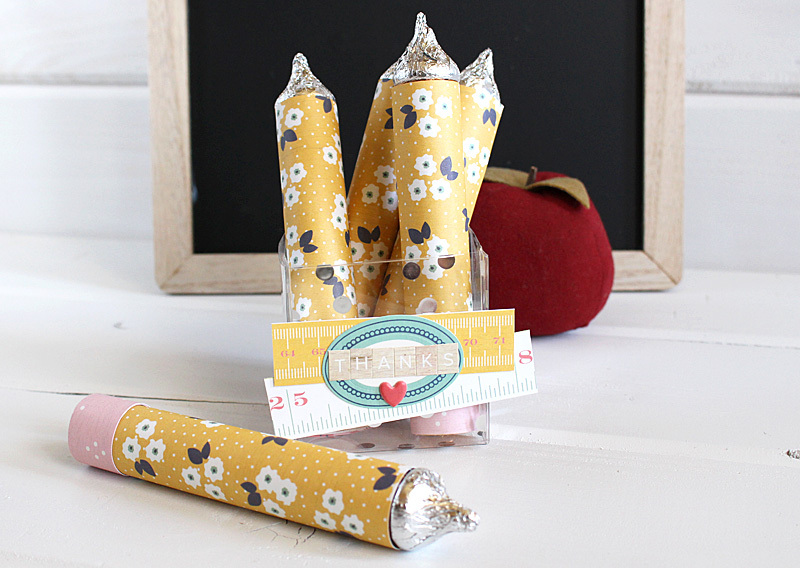 Kimberly here today with a sweet and easy treat holder to make for your child’s teacher. 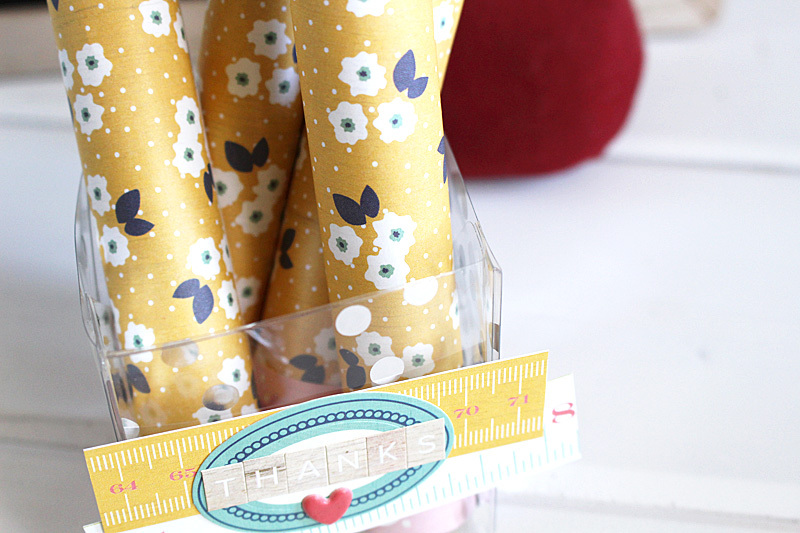 It’s a thoughtful thank you gift that your child can help you make. 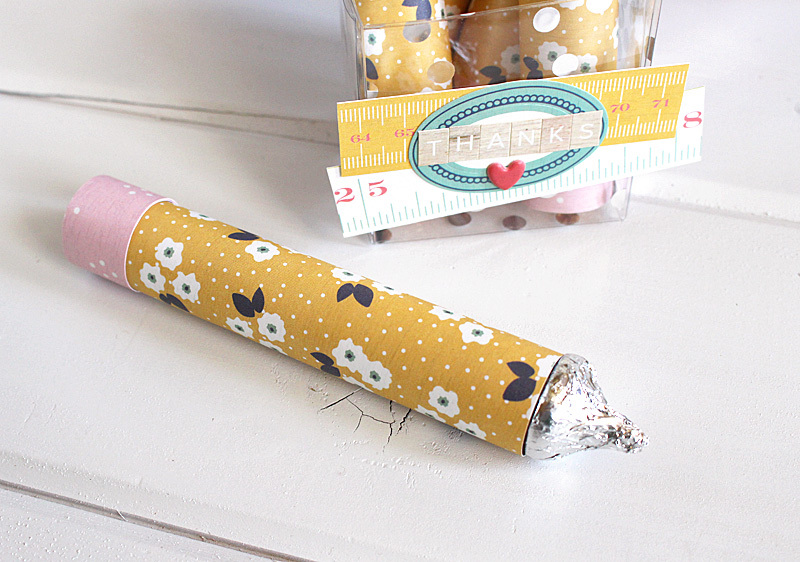 With chocolate inside the “pencils,” It is sure to bring a smile to the teacher’s face! 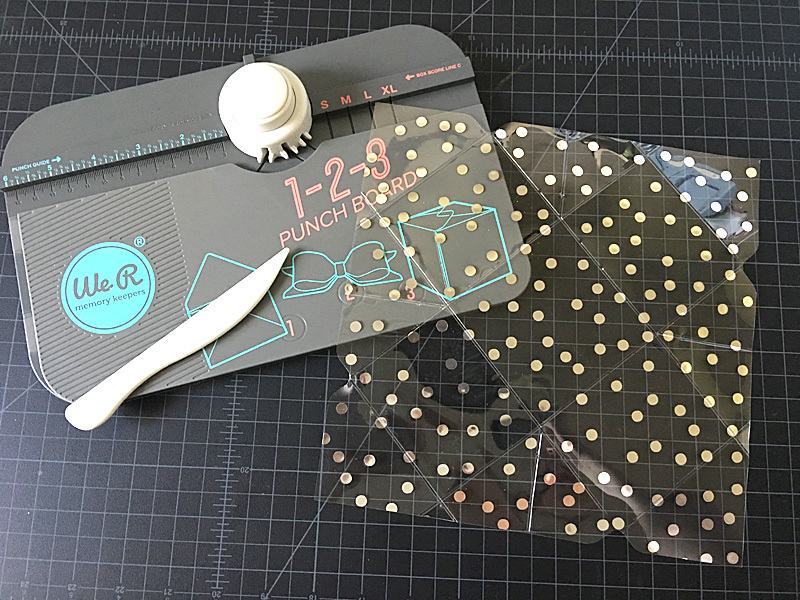 I began by creating a box using the 1-2-3 Punch Board and a piece of Confetti Dot Silver Acetate. Using the guide, I determined the size box I needed to hold my pencils and began creating. The punch board makes it very quick and easy to create a box. Because my box would be open on the top, I trimmed away the triangle edges on the acetate. These would be the pieces that would close the top of the box. With score lines already in place, trimming them away was simple. 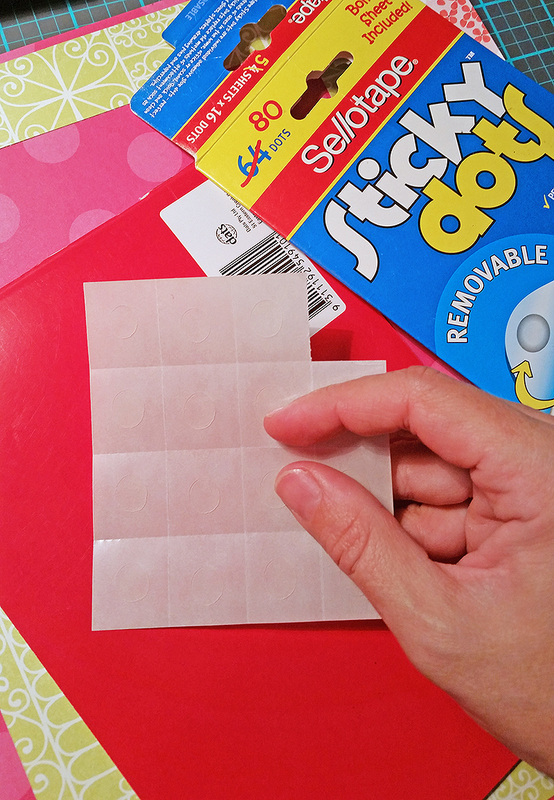 To keep the glue holding all the sides together as invisible as possible, I used glue dots. I love the look of the clear box with the silver polka dots. It matches well with the pencils. A Hershey kiss, with the flag removed was glued to the top for the pencil end. 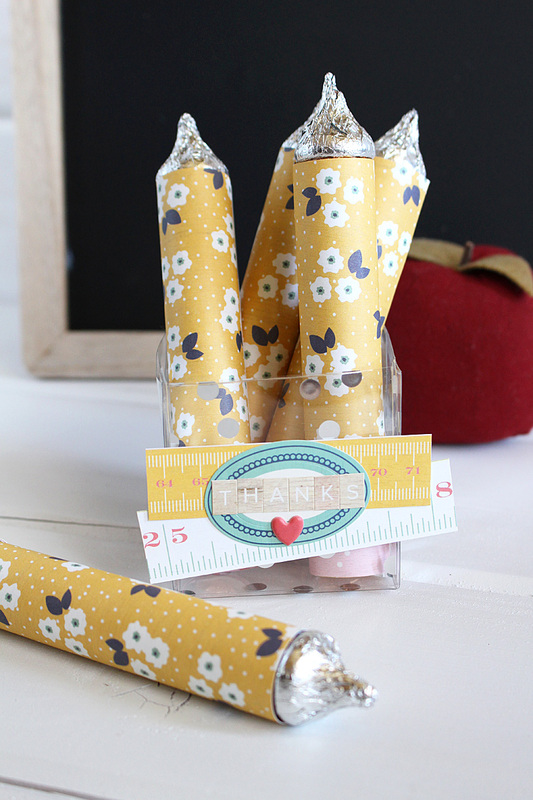 On the front of the clear box, I added two rulers cut from the Honey I’m Home Growing Up paper. It seemed to be a fitting touch to the teacher gift. A sticker was layered on top, along with the letter stickers to spell out, “thanks.” From the Puffy Stickers, a small heart was added. 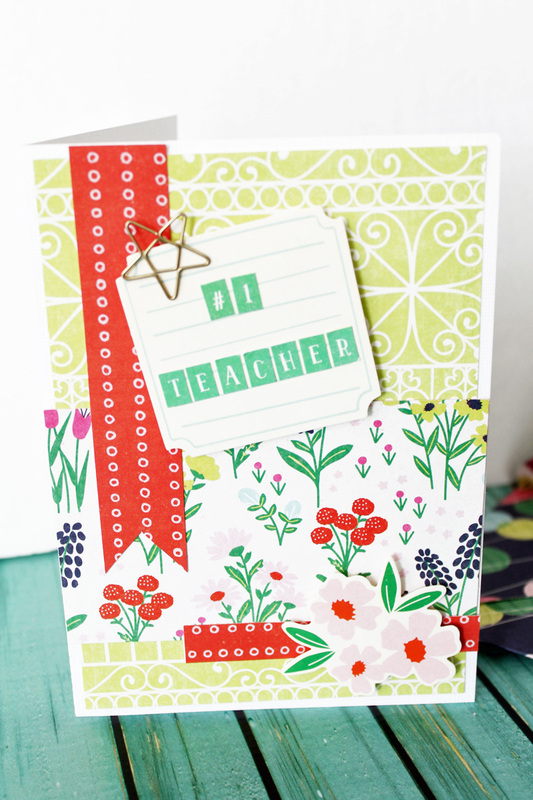 Now we have a thoughtful, handmade, heartfelt gift to say thank you to a well-deserving teacher. 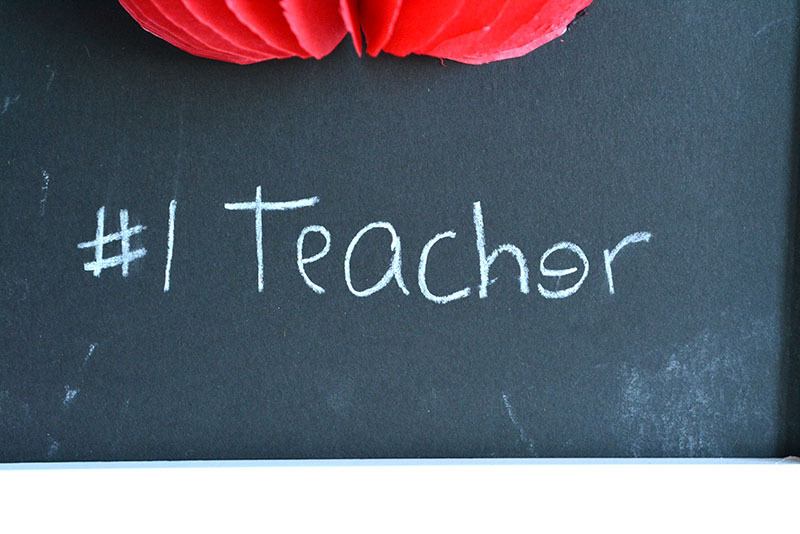 Thank you, teachers! Hi, We R fans! 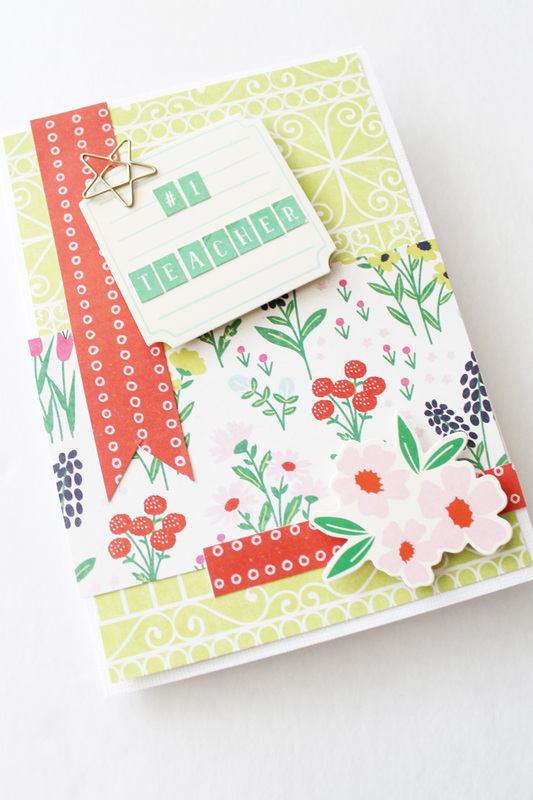 Laura here with a fun teacher appreciation card for you using the new Flower Girl collection. It is so pretty! It features reds, greens, navy, and pink – all the colors and patterns are just beautiful. To make this card I started by cutting some white textured cardstock to 10” x 7”. When folded in half, this will make a 5” x 7” card. 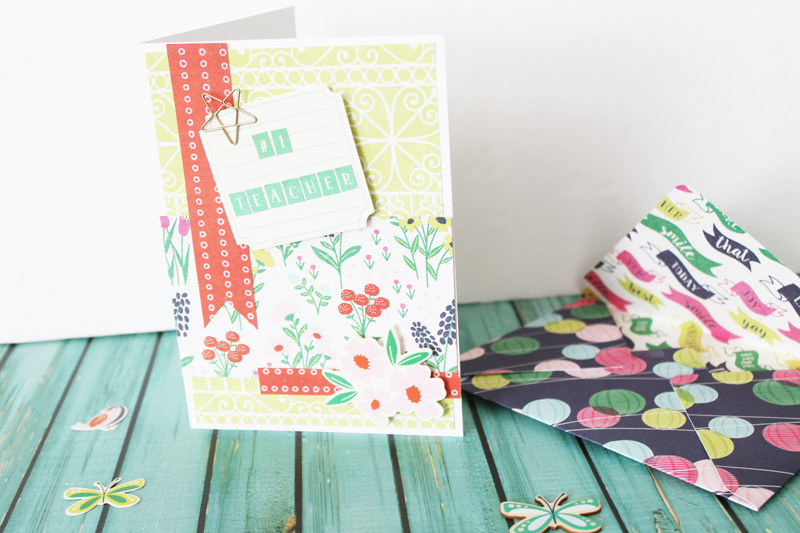 I added a green and white patterned paper to the front of the card. It is only .25” smaller than the face of the card. 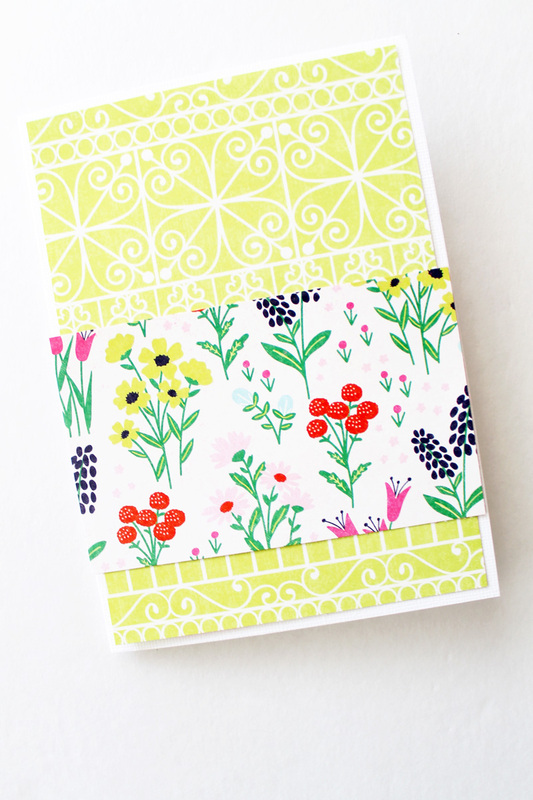 I added a 3-inch horizontal strip of the beautiful floral paper to the lower half of the card. 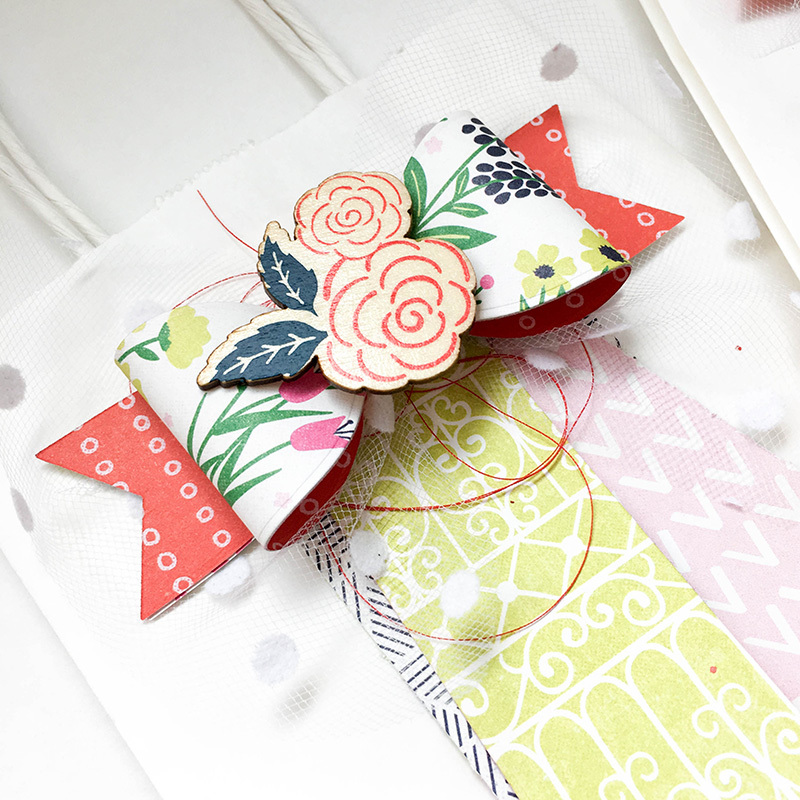 I created a faux ribbon with more of the paper from the collection. I cut a strip that was one-inch wide. At the bottom I simply snipped a reverse “V” shape with my scissors. I attached everything to the card using adhesive tape. 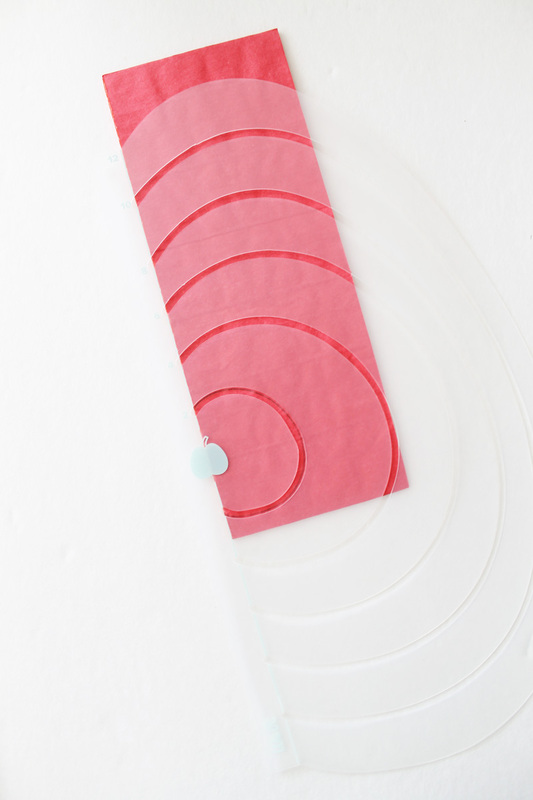 I created a little note paper using an ephemera cut out from the collection. I added stickers from the sticker sheet to spell out “#1 Teacher”. 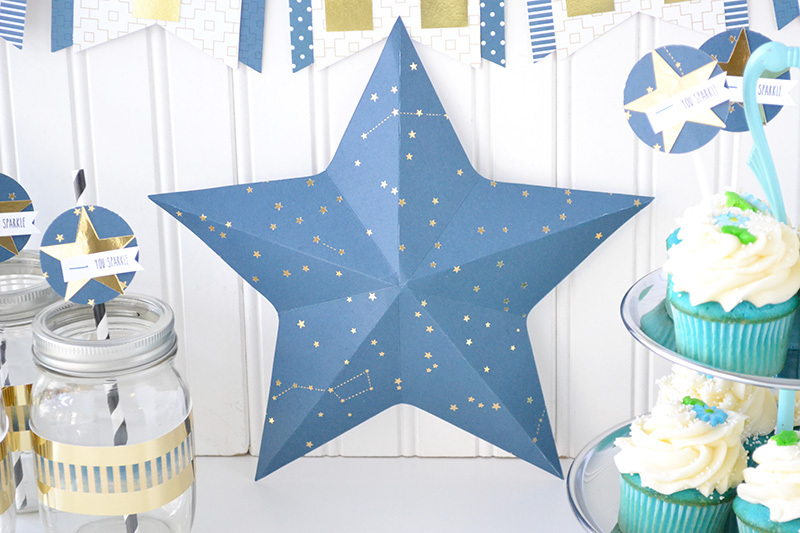 I used a little star decorative paper clip from the Oh Goodie! collection. I attached the note paper embellishment to the front with adhesive squares. The card still felt like it was missing something on the outside, so I added another small strip of the red paper to the front along the bottom edge of the floral paper and added a floral embellishment to the bottom using adhesive squares. 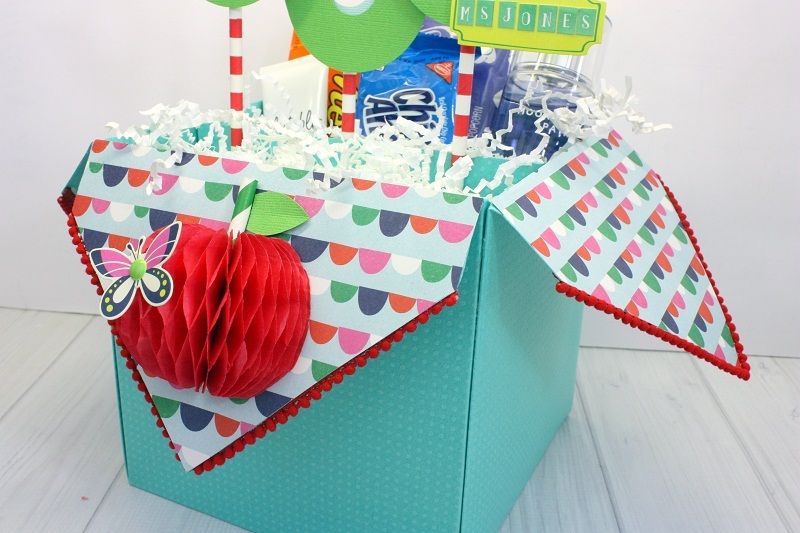 On the inside I used the DIY Party Honeycomb Stencil to create a cut out of an apple. I cut a stem and leaf shape from scraps of the green paper used on the front. I wanted the word THANKS to stand out so I used the same technique that I used on the Valentine’s gift box. 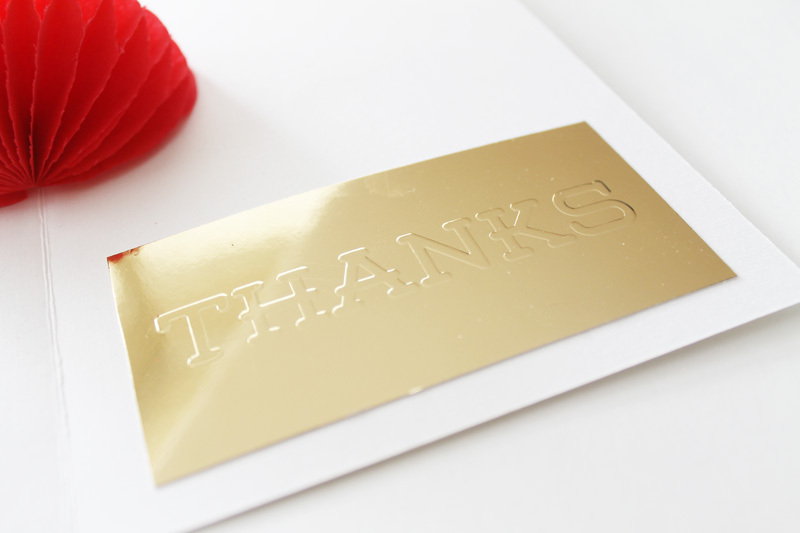 I used gold paper and my Evolution Advanced to emboss ‘THANKS’. 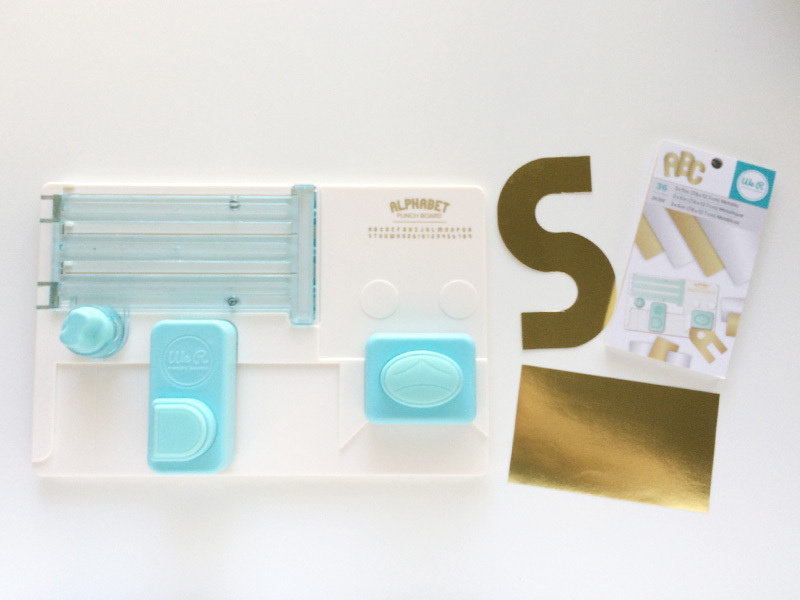 I created an envelope using the envelope punch board. 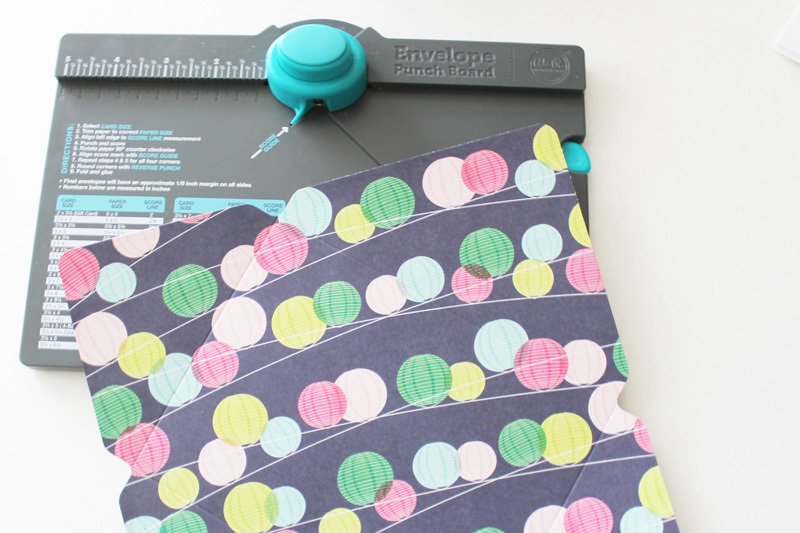 I love how the papers are patterned on both sides so when you create an envelope there is a fun pattern inside. The end-of-the-school-year is almost upon us! 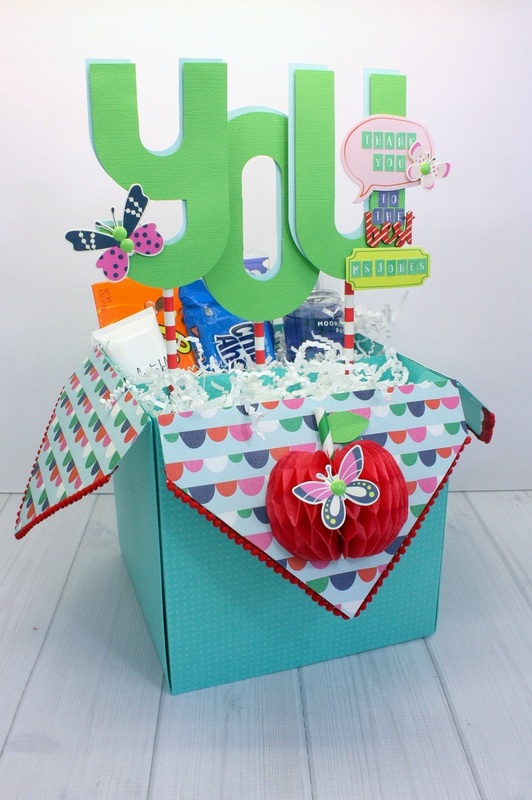 Hi there WeR friends, Shellye McDaniel here with a fun sort of “explosion” gift box that you can fill with loads of goodies for a teacher! I’m using the Template Studio Starter Kit along with the Mint Designer Poster Board and the Gift Box template that comes with the Starter Kit. To begin, I cut the poster board down to the correct measurement for the 7X7X7 gift box. 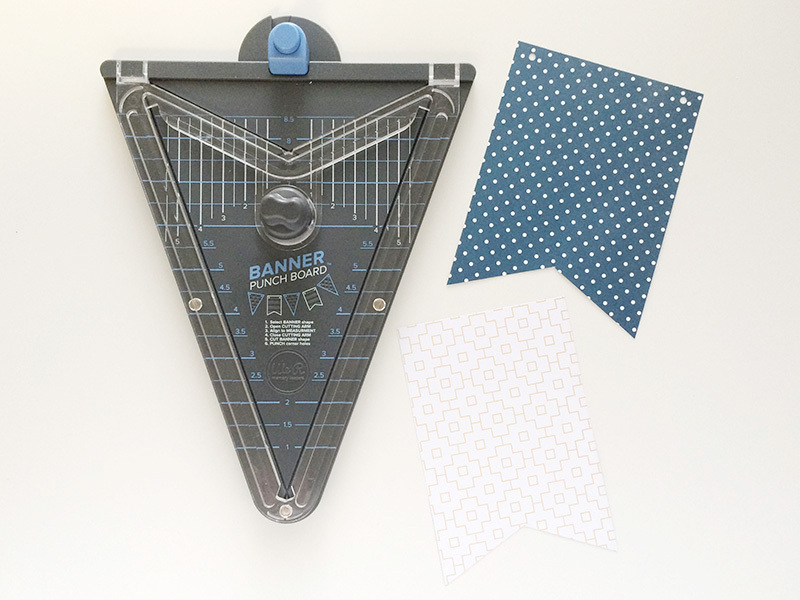 The poster was then placed onto the tri-fold mat and the cutting/scoring guides were snapped into place as noted on the instruction card. After completely following the step-by-step instructions for the box, it was assembled and secured with high tack adhesive. I decided to leave the top flaps open so that the box resembles more of an “explosion box” style. 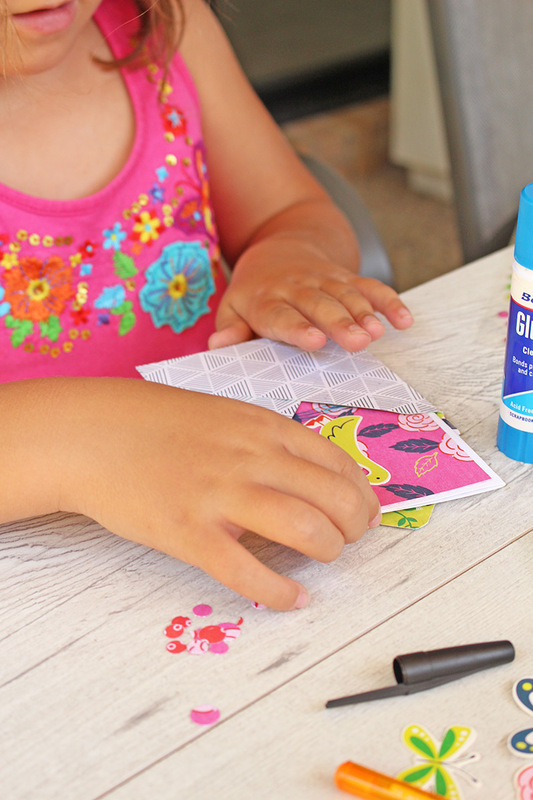 I traced around the flaps onto the Bouquet Patterned Paper from the “Flower Girl” Collection. The paper was then trimmed out and attached to each of the four flaps. I added some mini red pom-pom trim around the edges of the flaps to give the box extra detail. 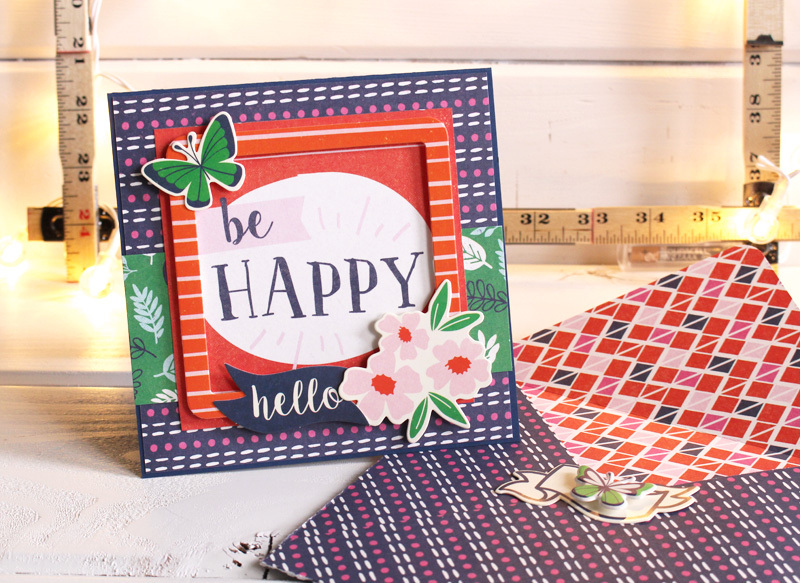 Using the “Blossom DIY Party Honeycomb Pad” I cut a small section from the red honeycomb pad. Next, I cut the section into a semi-circle, adding a small indentation at the top. When the honeycomb paper was opened up, I had a 3”W X 2.5”H apple shape. I secured it to the front flap with glue and then added a paper straw for the stem. I took a left-over piece of the poster board and cut a strip to measure 11”W X 5”H. Two flaps were made by scoring the strip 2” from both ends. The flaps were then adhered to the inside/center of the box. 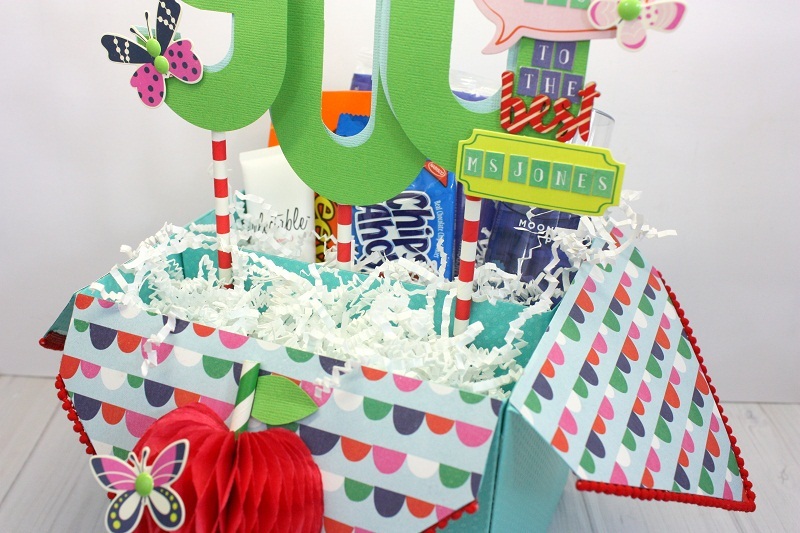 You will need to make adjustments depending on the width of your box. Now to dress up the inside of the box! 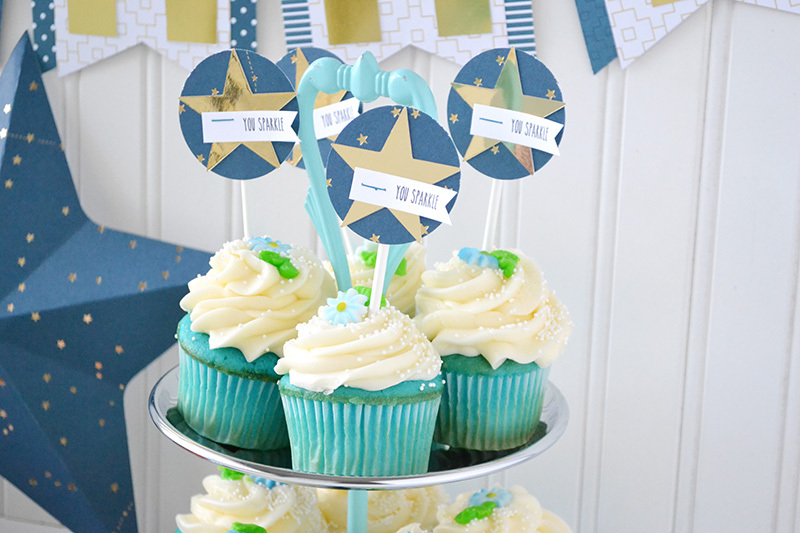 I used the Alphabet Punch Board and three sheets each of the powder blue and Kelly green from the “Basic Cardstock 3X5 Pad”. 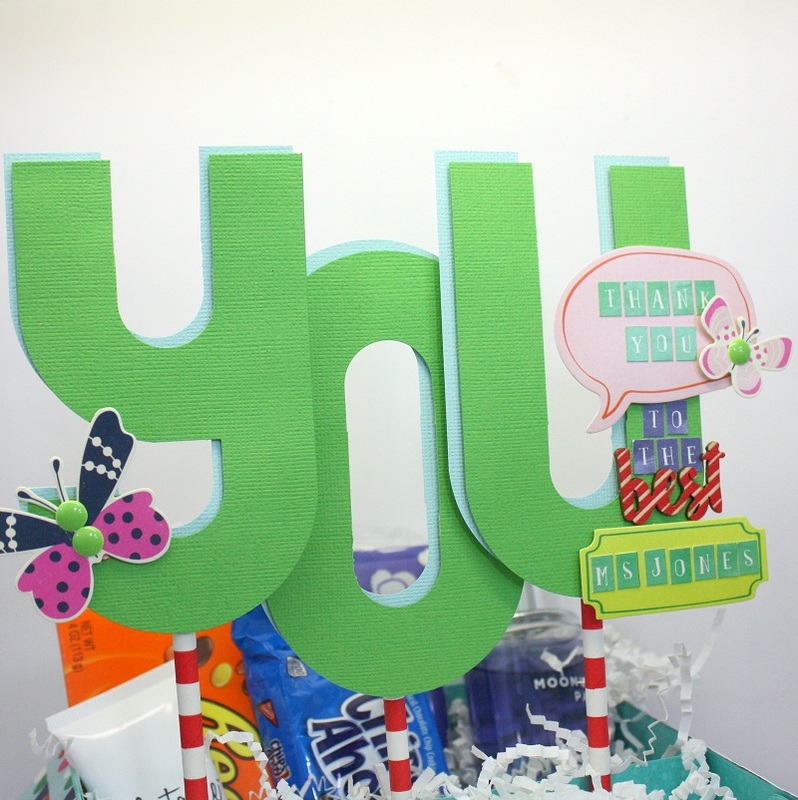 The letters Y, O and U were punched from both of the paper colors and then layered together with foam adhesive to give a ‘shadow’ effect. The letters were then adhered to a standard paper straw and then glued to the inner strip that we created in the step above. 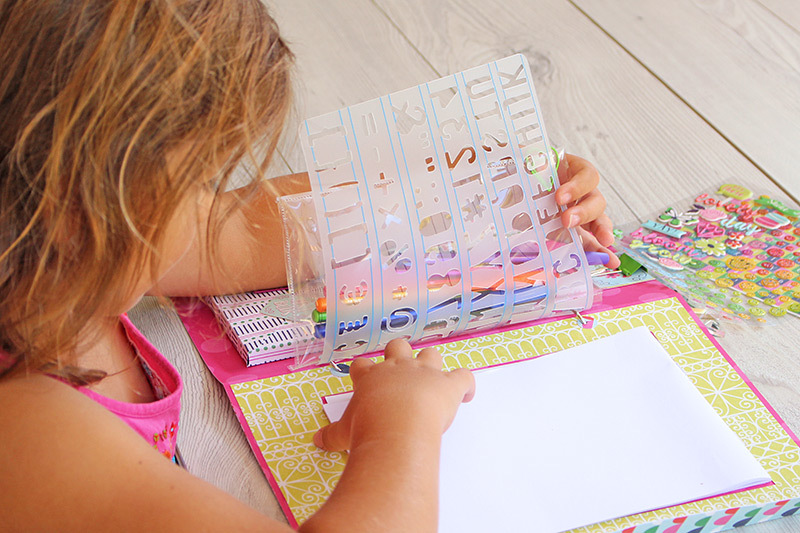 I used various pieces from the “Flower Girl Collection” to embellish the alphabet letters and sticker letters to personalize it! Hi WRMK fans! Amanda here today. 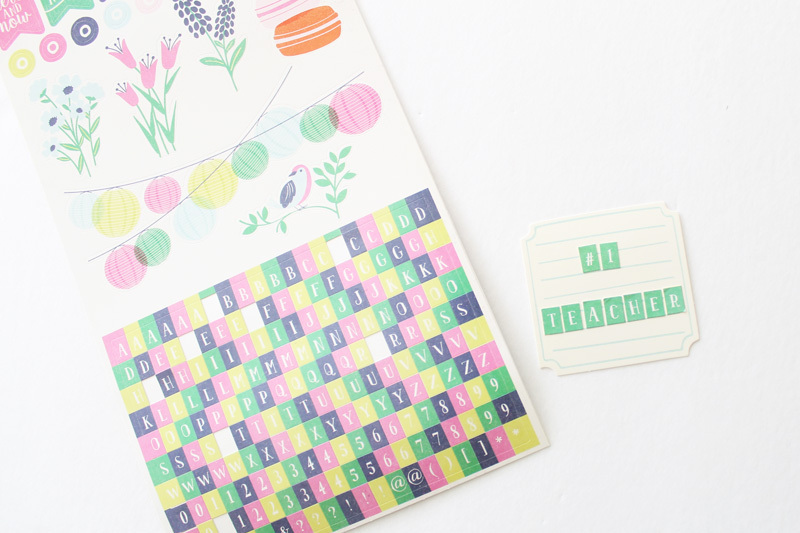 Teacher appreciation week is fast approaching but it’s not too late to put together a thoughtful, handmade gift for the guardian angel that teaches/puts up with your kid everyday. 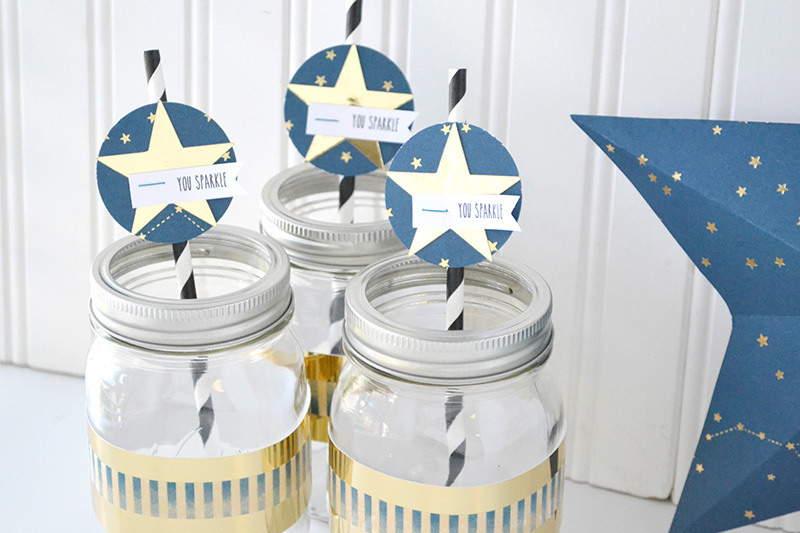 Even kids can get involved in this fun project. 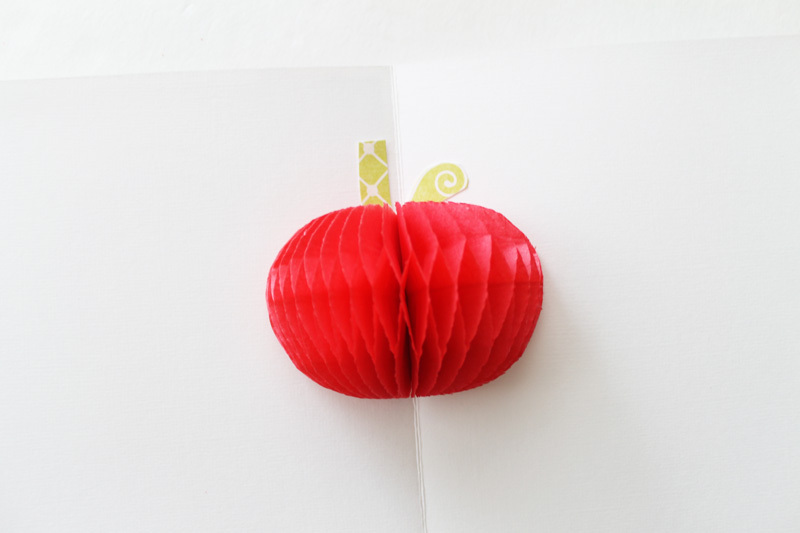 Perhaps I should have asked some teachers for their thoughts, but I think there is nothing more lovely and sweet than the iconic bright red teacher apple. A thoughtful piece of framed art doesn’t have to be complicated. 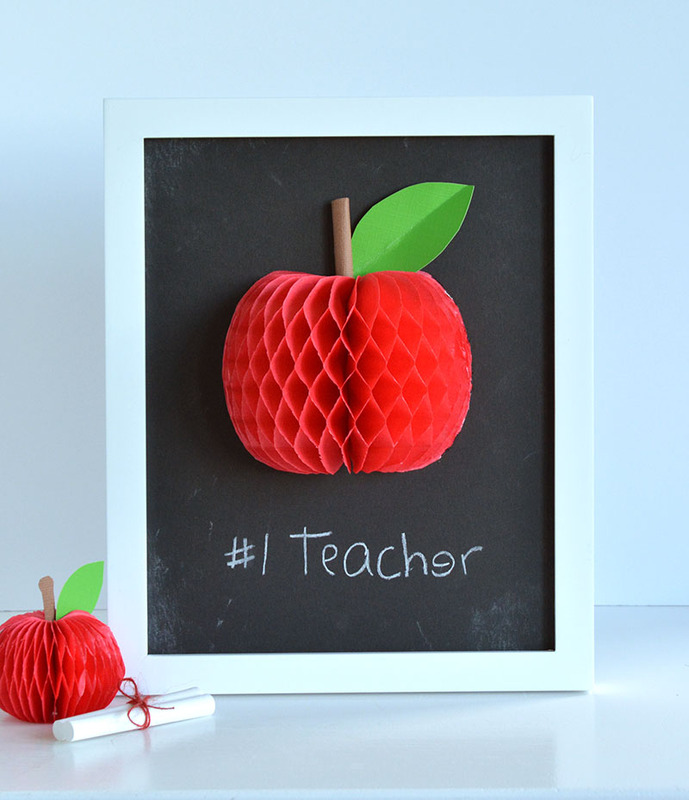 A simple apple made out of DIY Honeycomb paper in an 8”x10” frame is just enough to make a teacher feel special and loved. 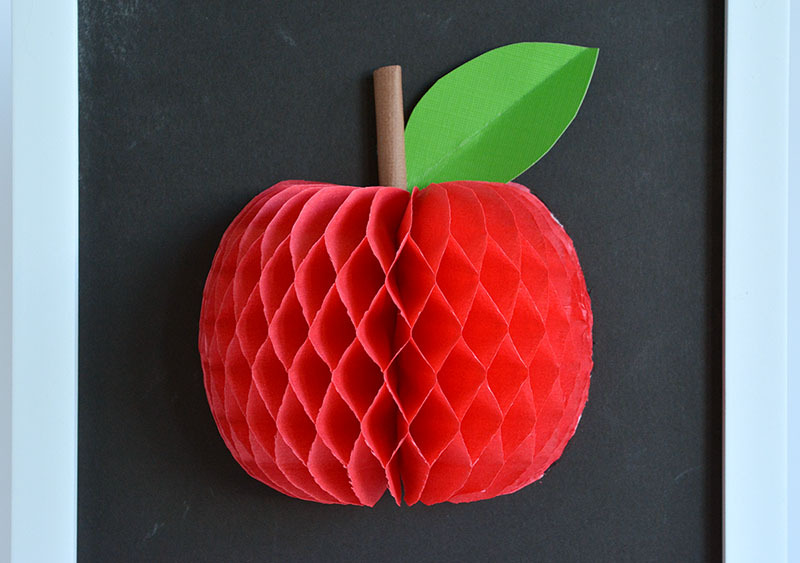 This bright red honeycomb apple looks almost good enough to eat. The dimension added by the honeycomb will definitely make this gift stand out on a table or wall. Adding a stem and leaf to your honeycomb apple is super easy. 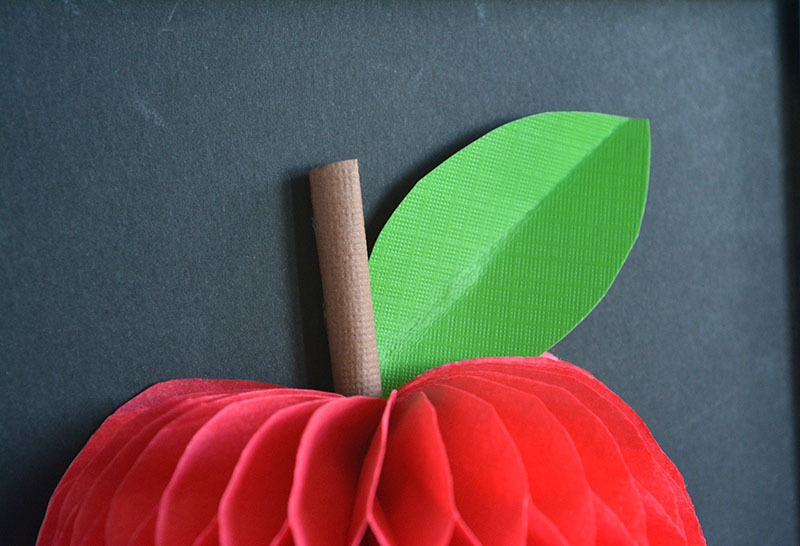 Simply roll a piece of brown cardstock into a tube and adhere on top of the apple. 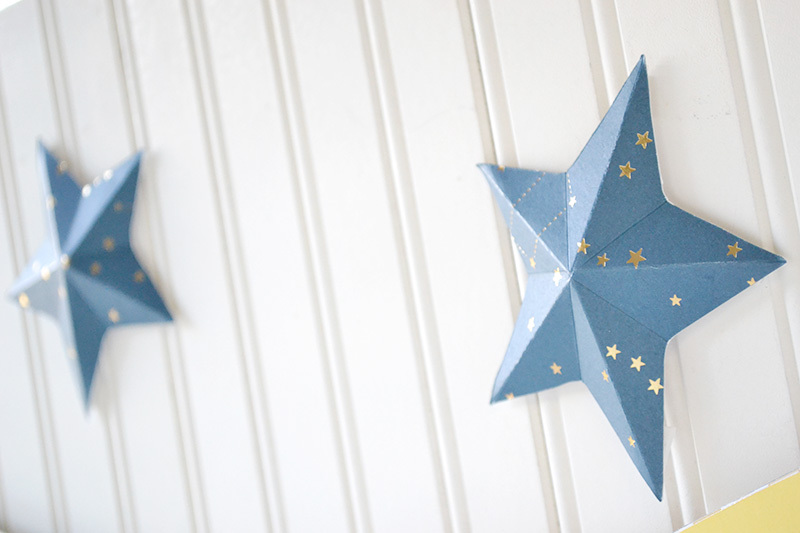 Free-hand cut a leaf from scrap cardstock, add a crease down the middle and adhere to the cardstock. Super easy, even for the kiddos. 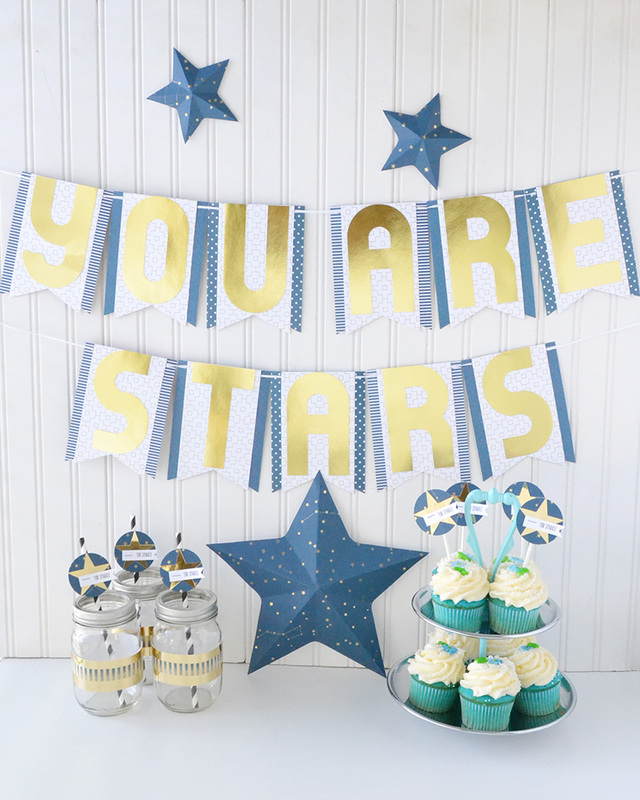 Make your gift extra special by having your child write a sentiment or phrase with chalk. 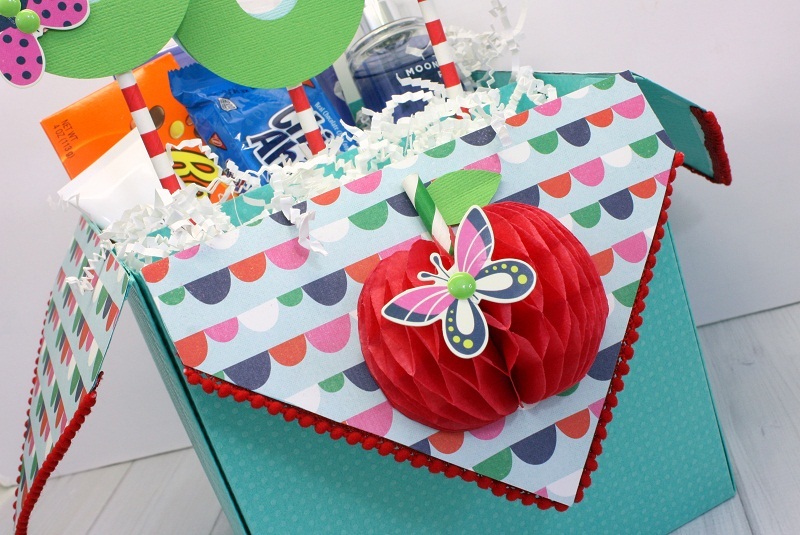 The DIY Party Honeycomb stencil kit comes with all kinds of fun shapes, including an apple. 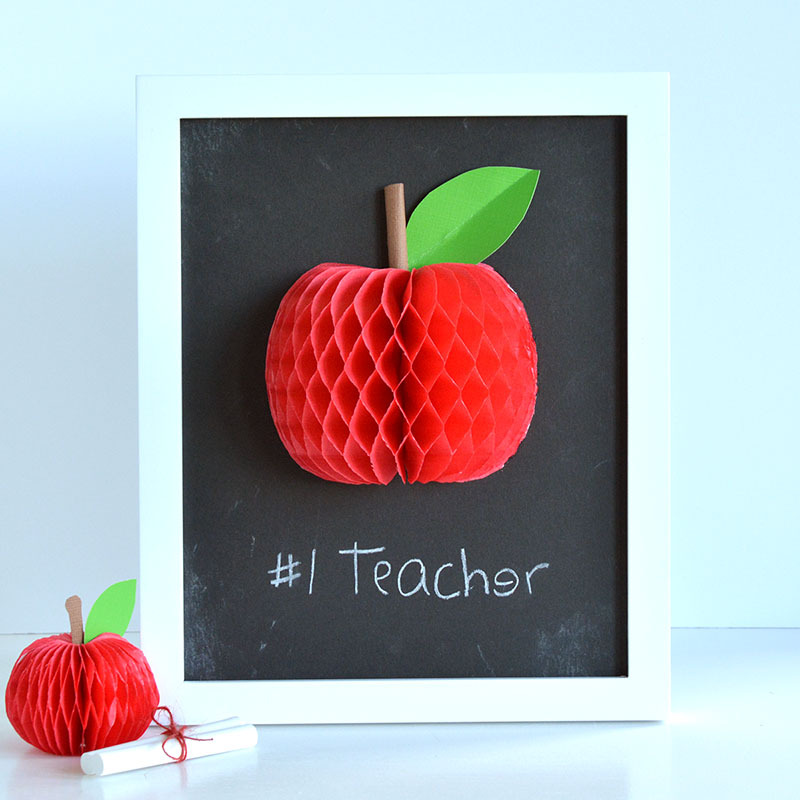 For an 8”x10” frame, trace the 4” apple onto a DIY Party Honeycomb pad. Since we only need half of an apple, you only need to trace one. 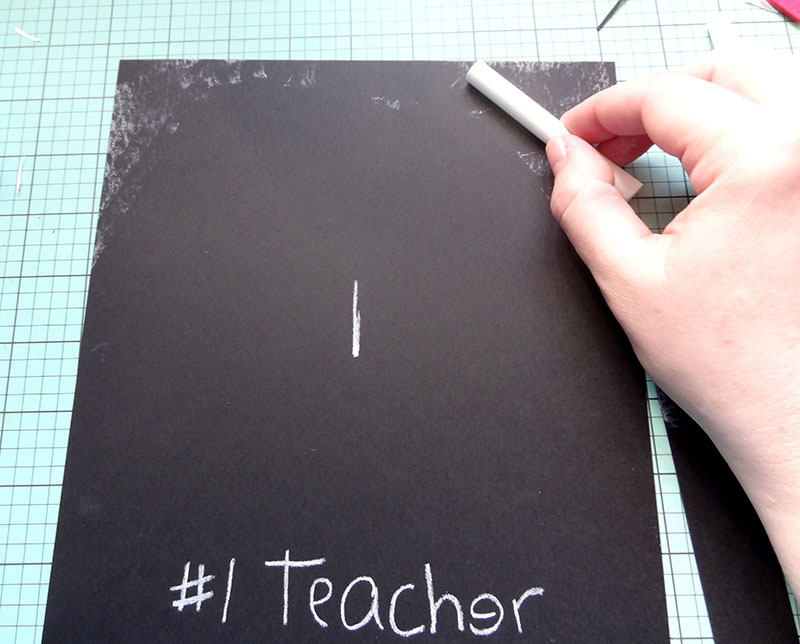 There’s no need to get specialty chalkboard paper. Distress a piece of black cardstock with some chalk to add some detail. And just for fun, make some smaller apples by tracing the 2” apple stencil. 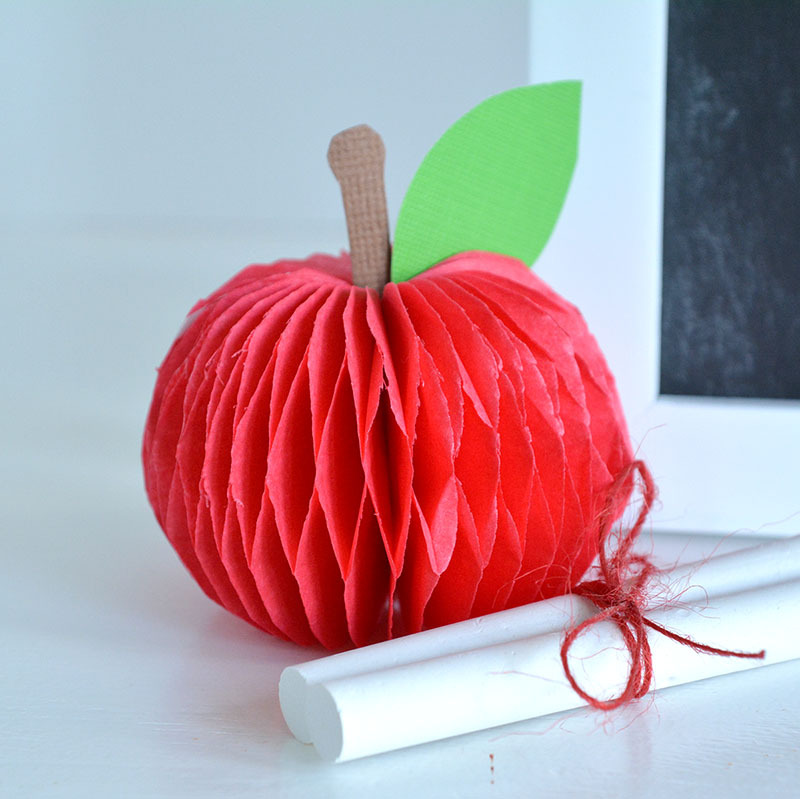 Heck, make a bunch of small apples for the cutest teacher appreciation garland ever. I have a TON of wildflower pictures that I could scrap with this collection. Thanks for the chance to win. Congratulations Pam! Please send an email to alydosdall@gmail.com with “Flower Girl Winner” in the subject line. Include your name and shipping address, and we’ll get your prize to you asap. 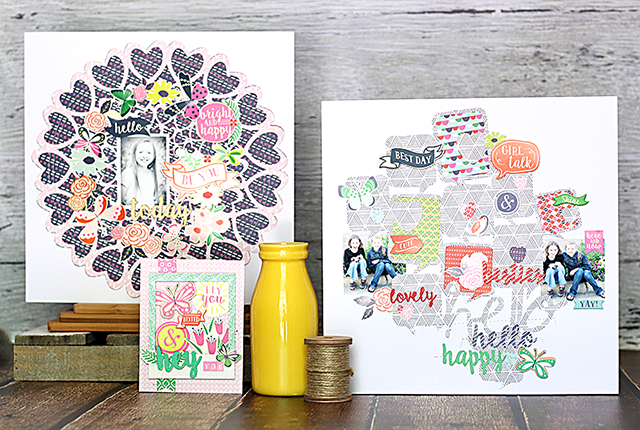 We’re thrilled to welcome guest designer Ashley Horton today to share some project using Flower Girl. Get to know a bit more about Ashley, visit her social media channels, and then enjoy her gorgeous projects below! Hi! 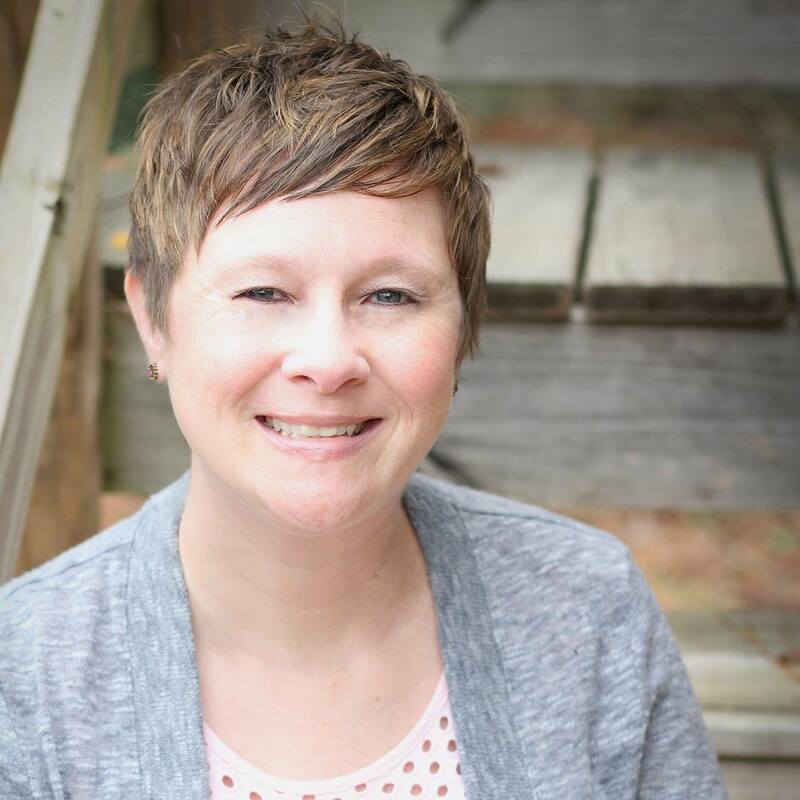 My name is Ashley Horton, and I live in the Southern US, with my husband Tyler and our three children. 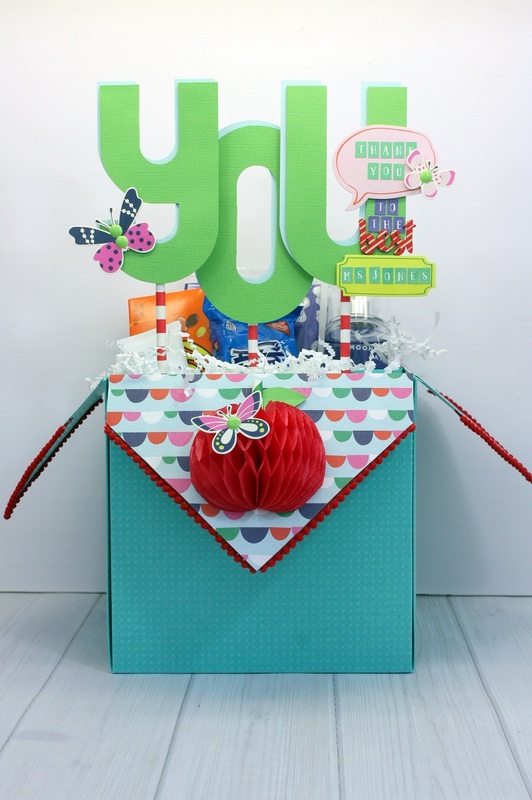 I have been scrapbooking for 10 years, and I have loved every moment of it! 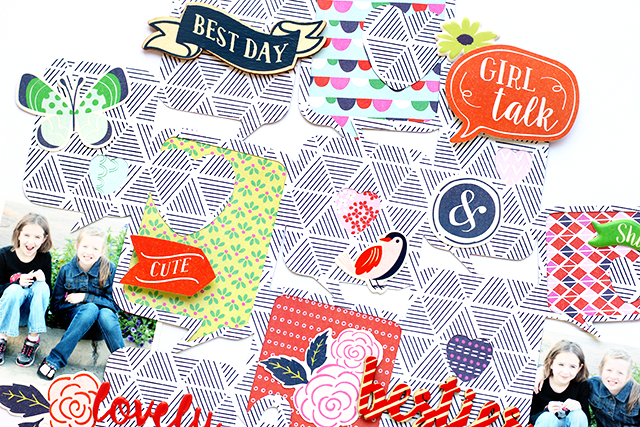 I currently design for Crate Paper, Pink Paislee, Hip Kit Club and A Flair for Buttons. 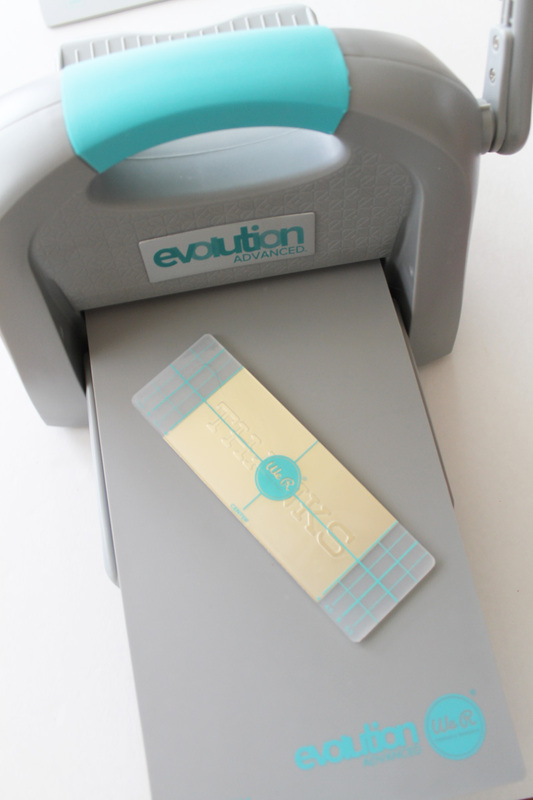 I also own an Etsy store, called The Cut Shoppe, where I sell digital cut files and printables. Most of my time is spent between homeschooling our three children and scrapbooking, but I also enjoy reading and cooking! 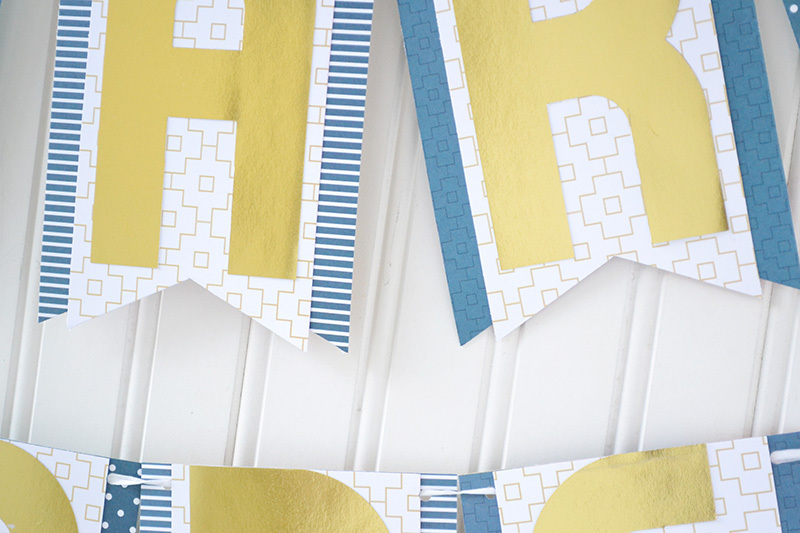 I love to use large die cuts on my layouts that let me feature a lot of patterned paper. 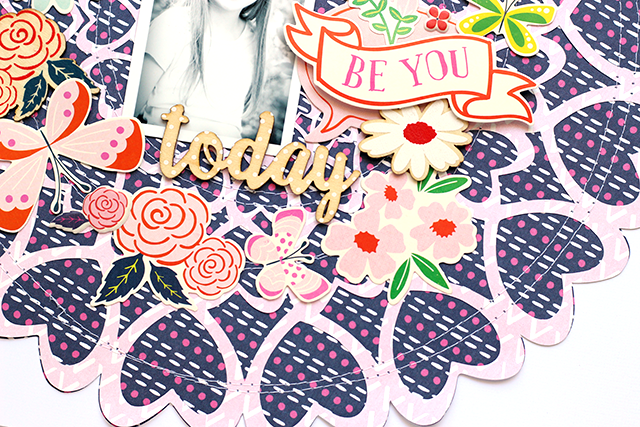 On the Be You layout, I cut a large heart die cut from patterned paper and backed it with a darker patterned paper for contrast. Because the background had a lot going on, I placed my photo at the center of the layout, to draw attention to it. 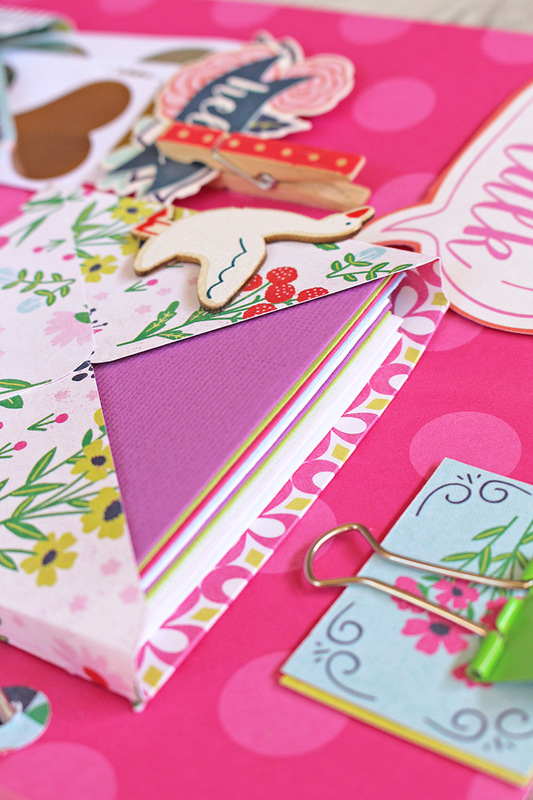 Then I used a mix of embellishments from the Veneer Shapes, Accent Stickers, and Ephemera to add interest to the layout. One of my go to products in a collection is definitely the 6×6 paper pad. 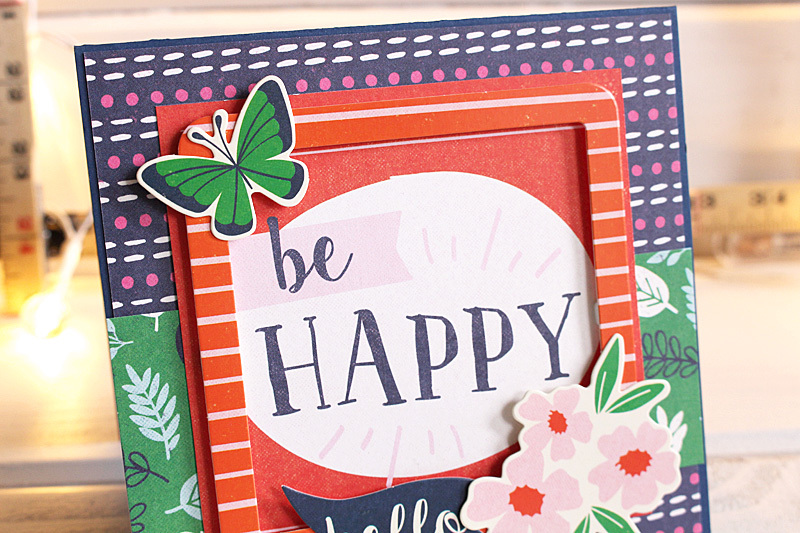 I love to use the papers from the 6×6 pad to back die cuts or create shapes for my layout. And the smaller pattern always looks great. 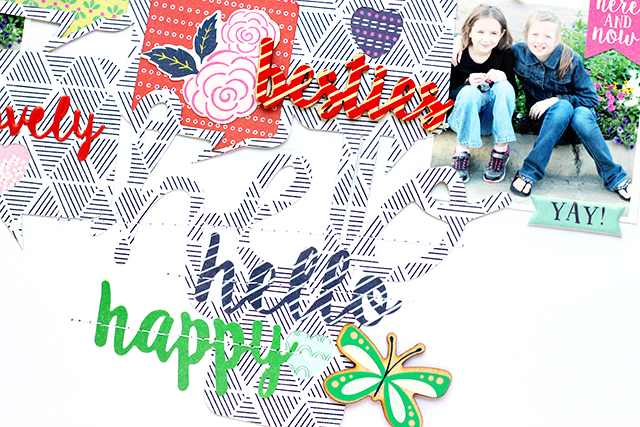 I used several pieces from the Flower Girl 6×6 paper pad behind a talk bubble cut file on my Hello Hello Happy layout. 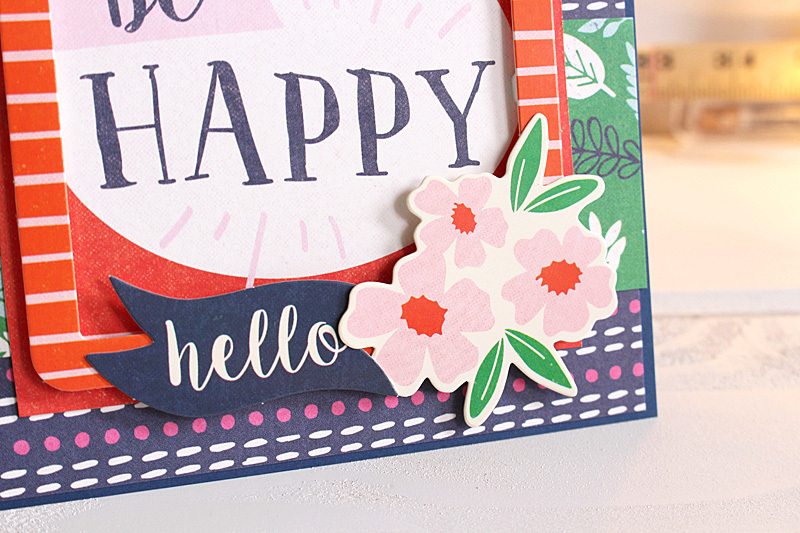 I love the pops of color against the cut file and White background. 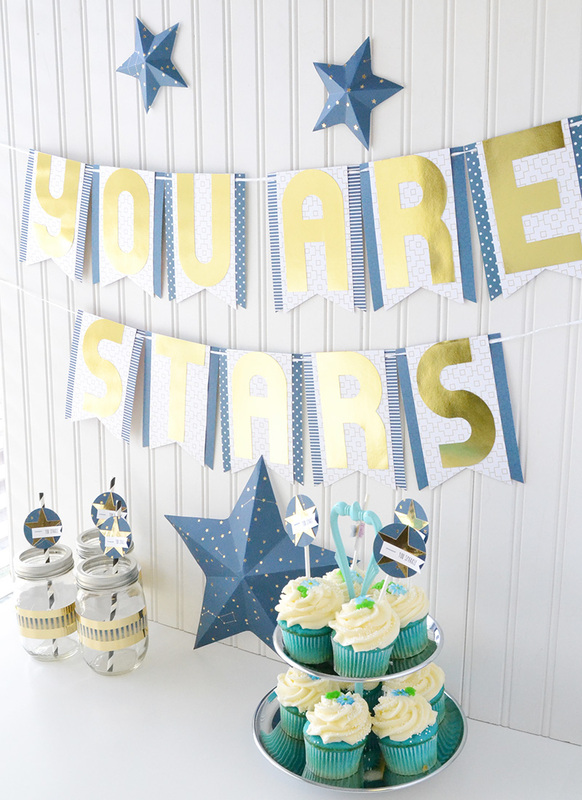 And all of the talk bubbles were perfect for adding embellishments from the Flower Girl collection. 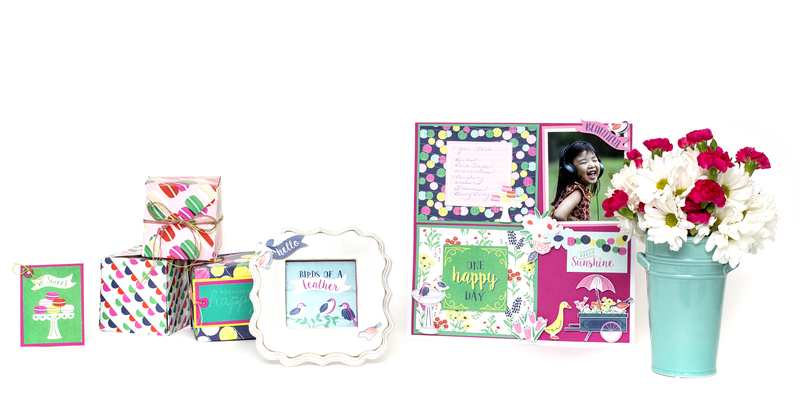 Frames are always a fun embellishment, and they work great on cards! 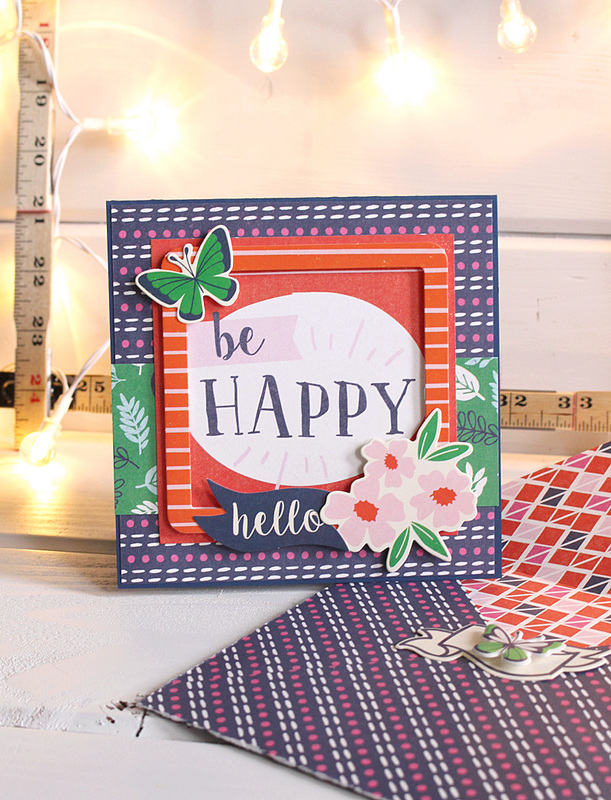 I used one of the frames from the Card & Frame Kit to create a layered design. I placed the frame in the center of the card and then used embellishments from the Veneer Shapes and Ephemera to place inside the frame. 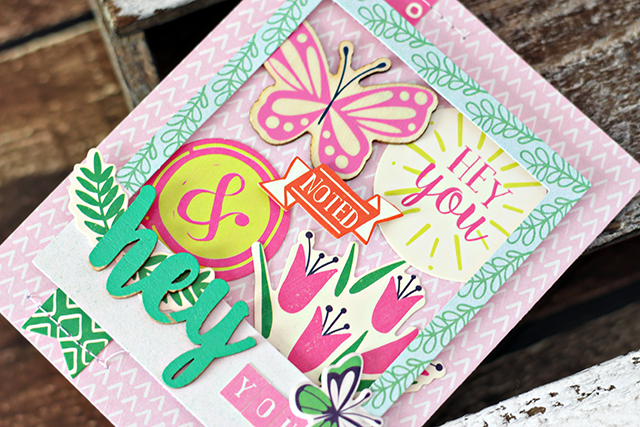 I added a sentiment with the Veneer word “Hey” included in the Veneer Shapes and paired it with the word “You” using stickers from the Accent Stickers sheet. Thank you for joining us today Ashley. 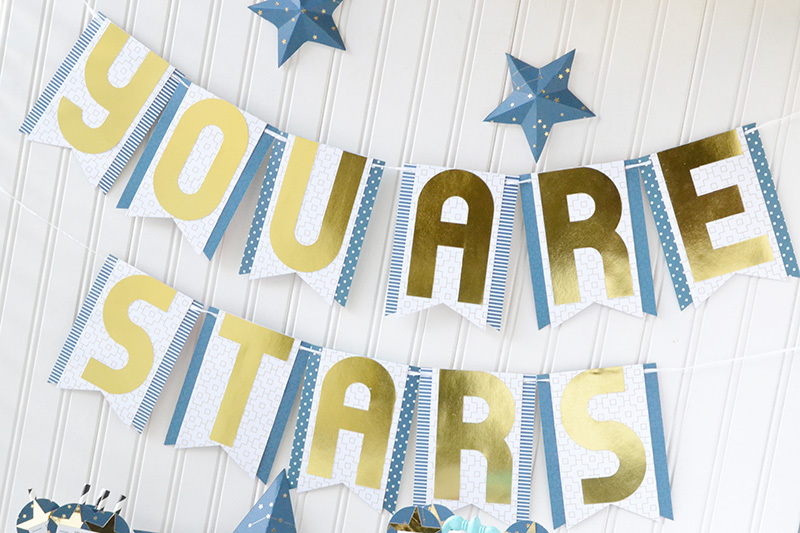 We love your beautiful projects! Hello, friends! Tessa Buys here. 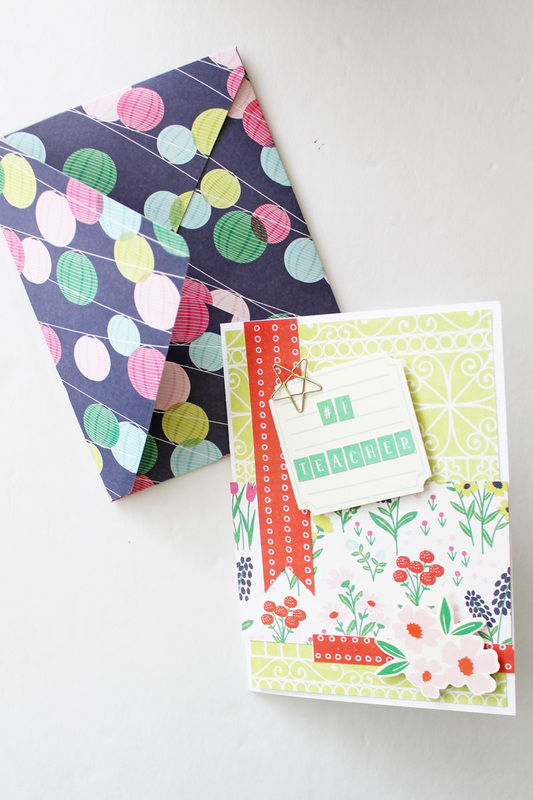 Whenever I need to wrap a gift, I almost always turn to the trusty gift bag. 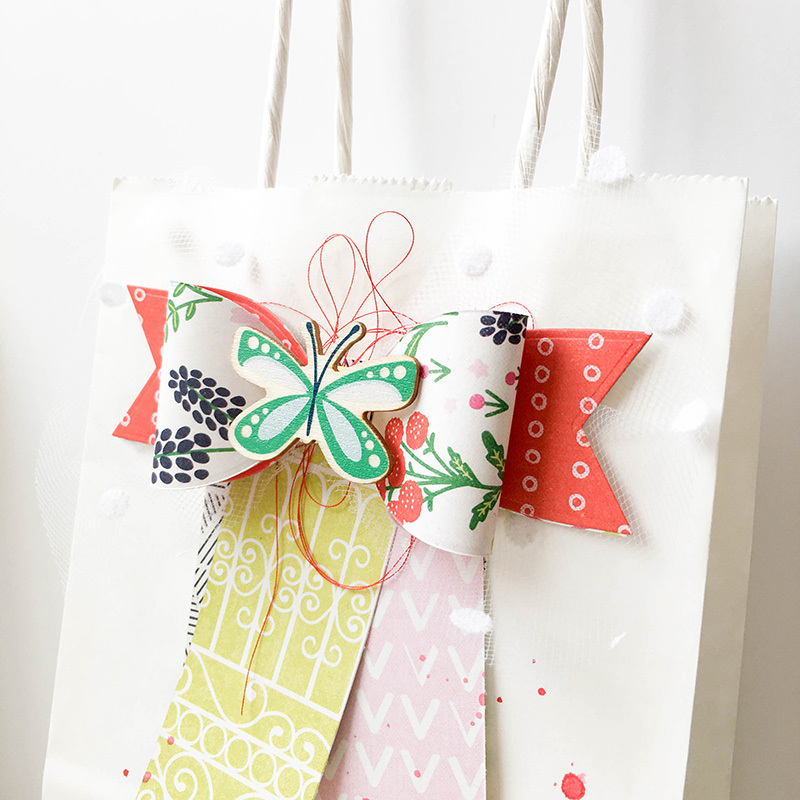 I keep a stash of plain white bags in my craft room. 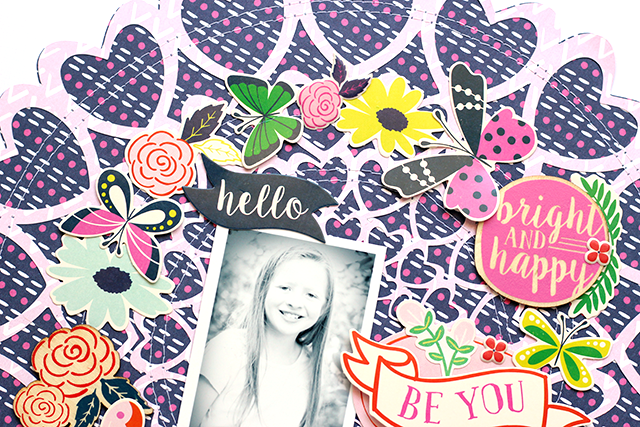 They are fun and easy to dress up with my scrapbooking supplies, and today I’ll show you how to embellish your own with the Flower Girl collection by We R Memory Keepers. 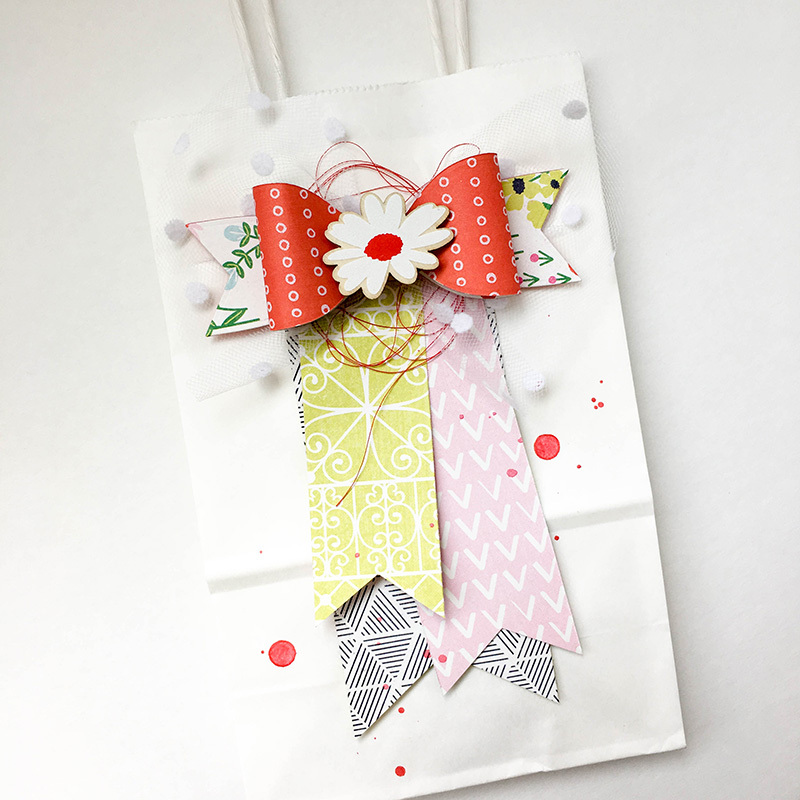 Using We R Memory Keeper’s bow die and Evolution machine, I cut bows from the two patterned papers. I placed the two different patterns back to back before assembling the bows. Next, I used foam adhesive to attach wood veneer pieces from the Flower Girl collection to the center of each bow. 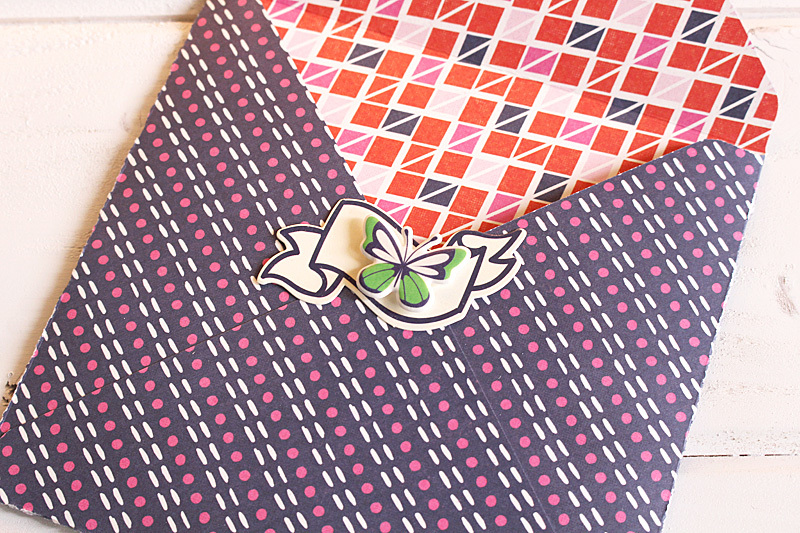 With the bows done, I cut some long pennants from other Flower Girl patterned papers. 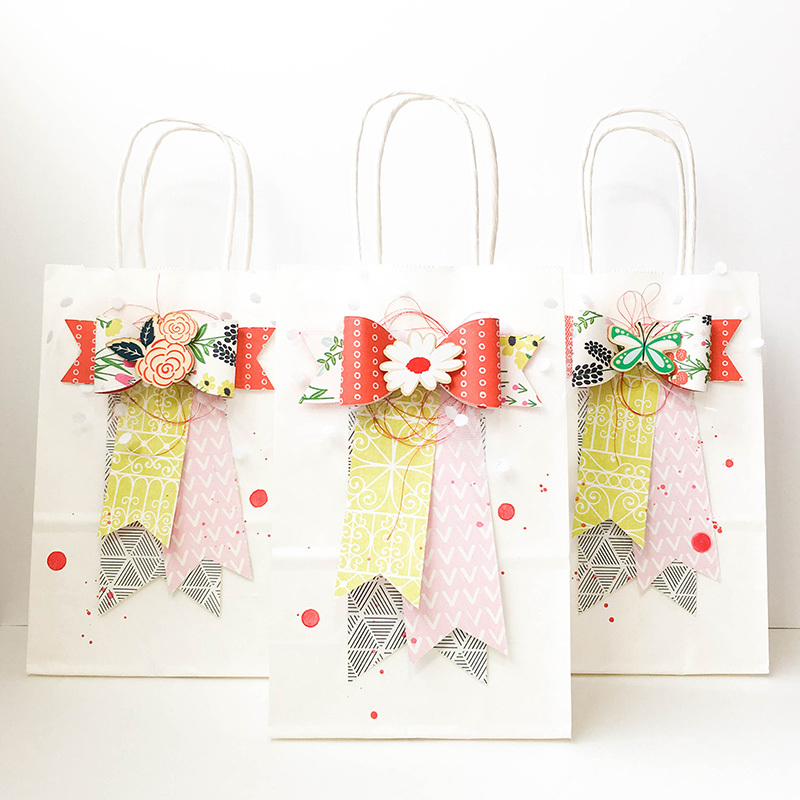 I layered them and glued them directly to the bags. The next layer is a long strand of red thread followed by a bow that I made from polka dotted tulle. I glued the paper bow to the top with hot glue. Last, I sprinkled some red ink across the bags for a festive touch. I can’t wait to give these gifts! 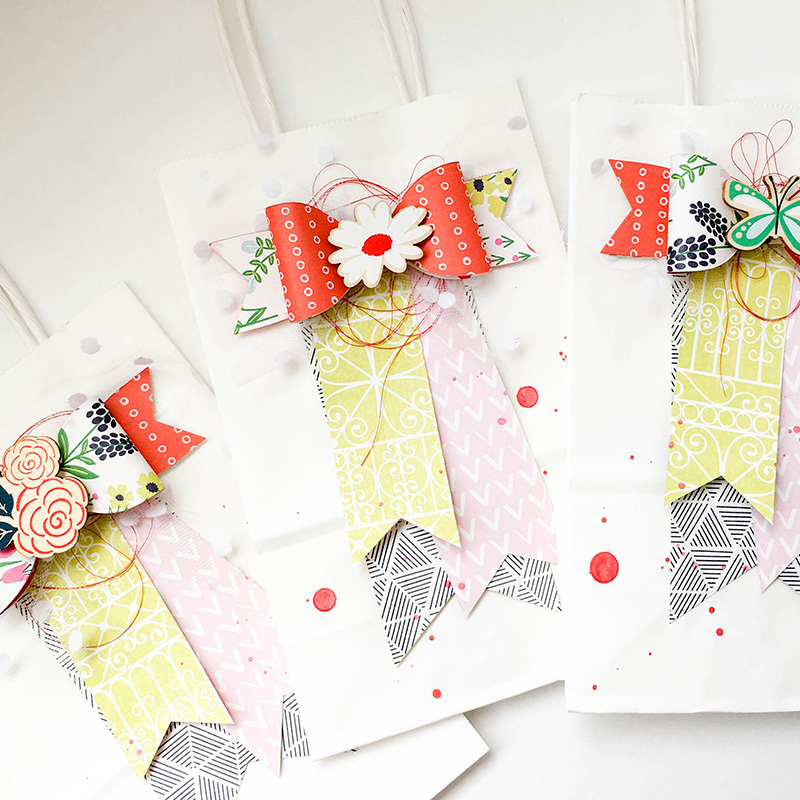 The fresh colors of the Flower Girl collection were so fun to work with, and I just know my friends are going to enjoy the gift wrap just as much as the gifts. 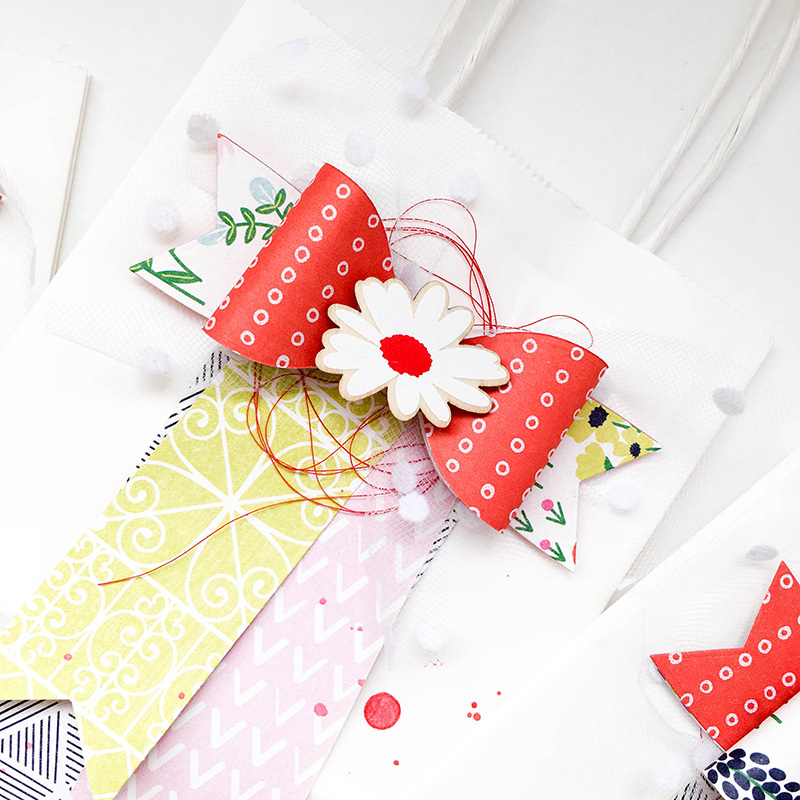 Stock up on white bags and pick up Flower Girl for your own gift giving! Hello again! 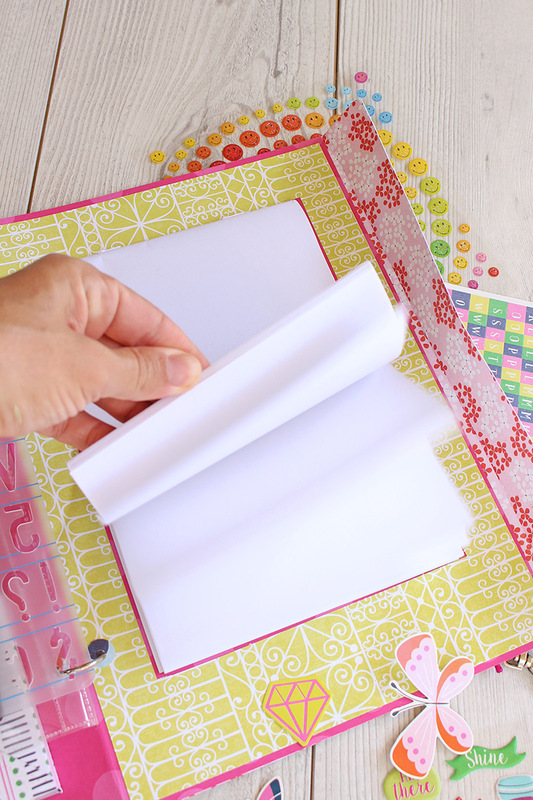 Chantalle with you today, to share this stationery folder I made for my little girl, using the gorgeous new Flower Girl collection. My Daughter absolutely loves to write letters and cards to all her friends. 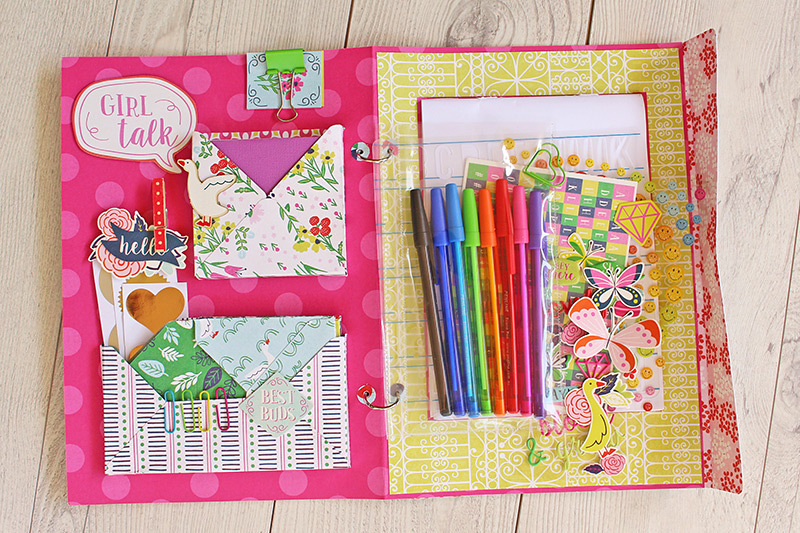 I have seen lots of different types of snail mail packs on the net and I thought a special folder, made just for her, would delight her! I’ve kept the design very simple, as she’s only five years old. 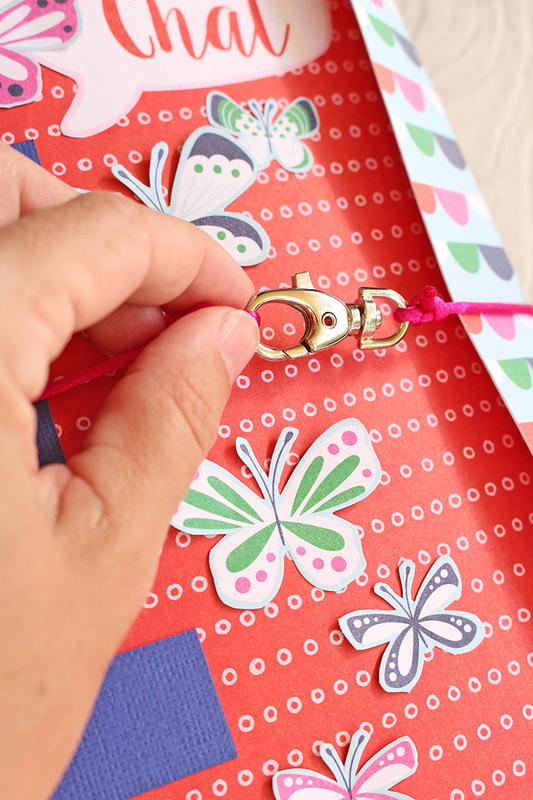 An A3 size folder, held closed by some hot pink string, which has been tied to a fastener. 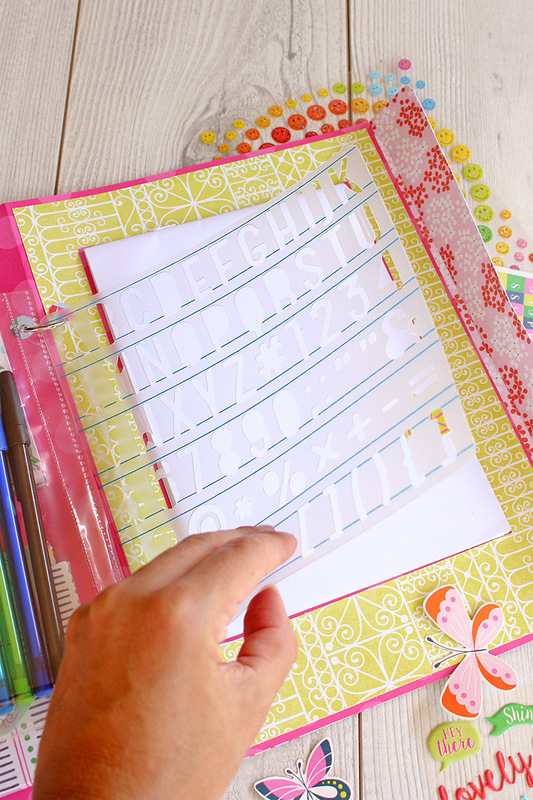 One could also use a large elastic band or pop some self-adhesive Velcro on the inside flap. 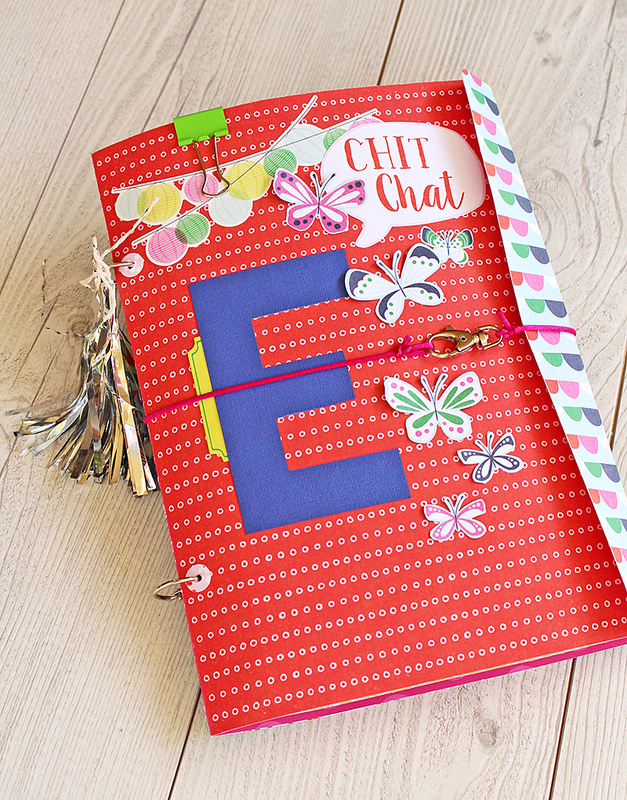 On the cover, I have used some Flower Girls stickers and a few elements which I have hand cut, like the ‘Chit Chat’ speech bubble from the Flower Girl Card & Frame Kit. There is also a large letter ‘E’ which I punched using my Alphabet Punch Board and some blue cardstock from the multi-colour Alphabet Punch Board pad. 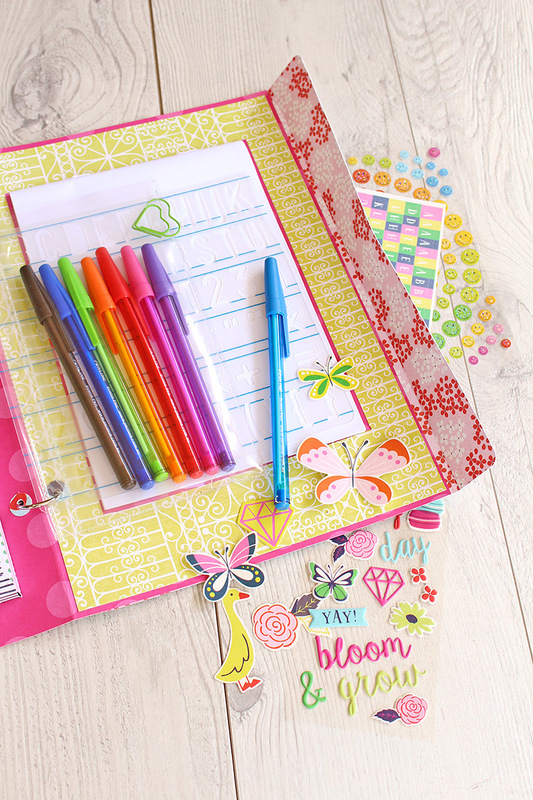 The folder opens to reveal some pre-cut cards, some matching envelopes, coloured pens, stencil, stickers and a note/drawing pad. It’s so easy to put something like this together for your kids. 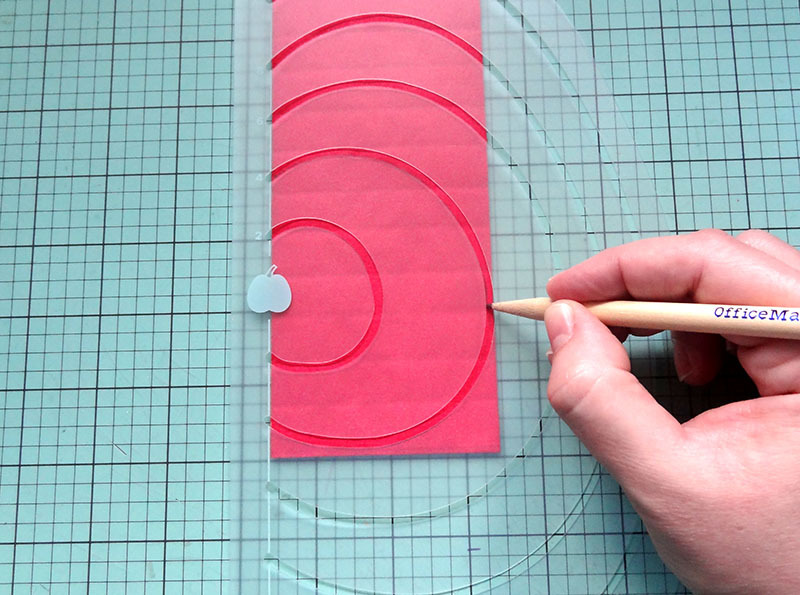 To start, I cut an A3 piece (420mm x 297mm OR 11.69 x 16.53 inches) from a sheet of Pink Designer Poster Board. I scored and folded it in half to create the folder. I’ve left the dotted print on side inside so I have a base pattern to work with. 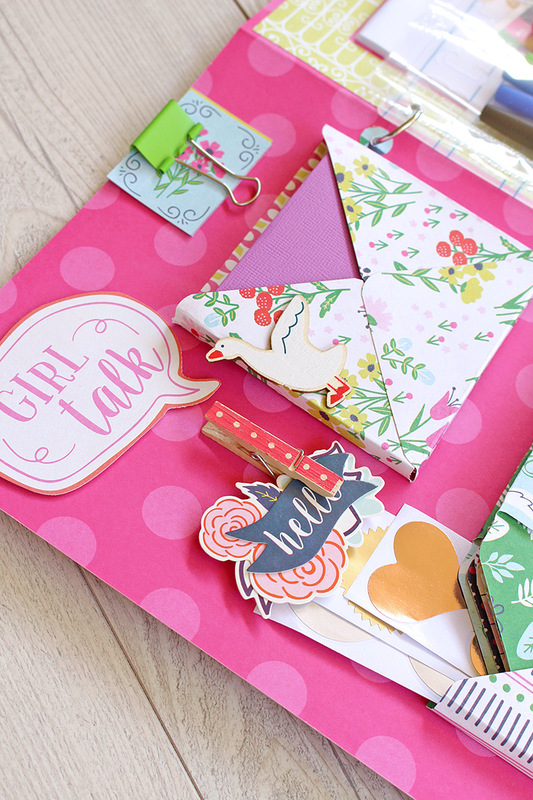 I then covered the outside of the folder with Flower Girl pattern paper. The front uses an A4 (297 x 210mm OR 8.27 × 11.69 inches) section and on the back I have used a slightly longer piece so I could create the fold which closes the folder. The back section was roughly 297 x 250mm (8.27 x 9.84 inches). You can see on the middle and far right picture below how the little fold sticks out further than the edge of the folder. While closed, I used my Crop-a-Dile to punch two holes down the lefthand side, through which I have added a book ring each. These will hold my stencil and a pen pouch. 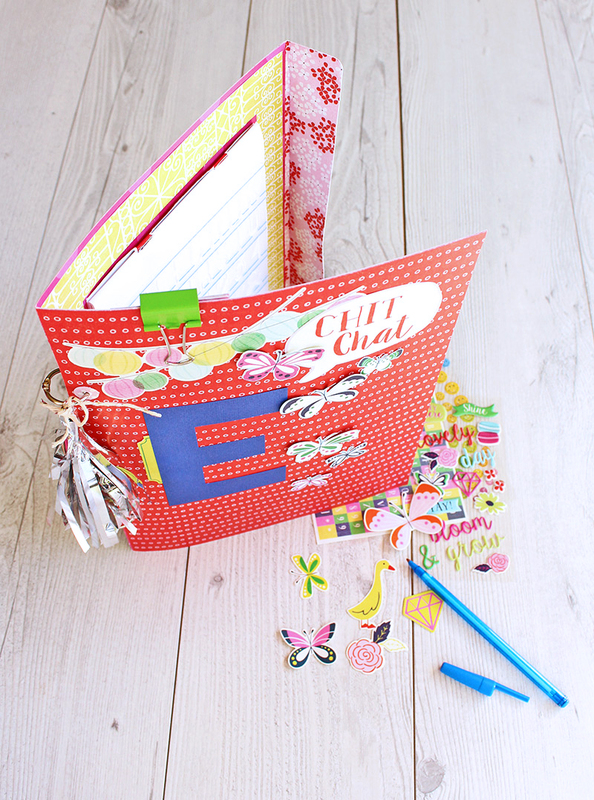 Once I had covered the folder, I had heaps of fun creating all the bits for the inside! 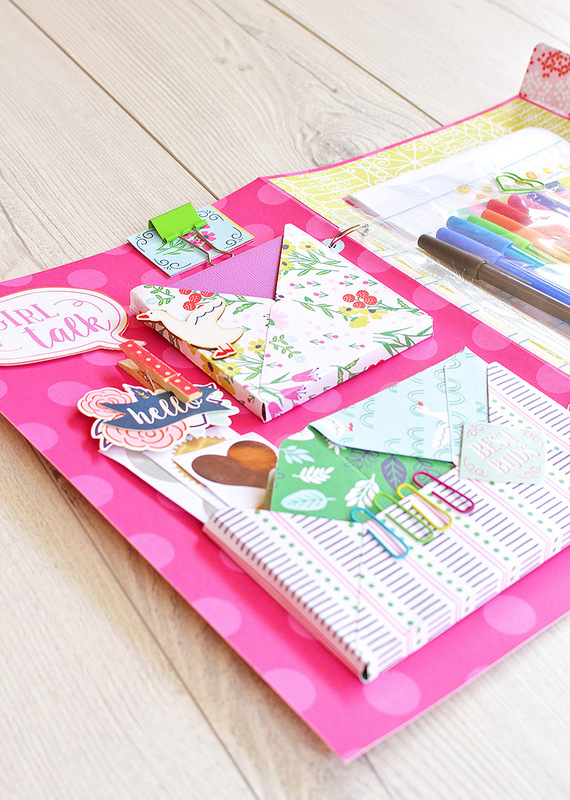 I made good use of my 123 Punch Board on this project, using it to create the cute envelopes and the box envelopes, which I’ve used to store the cards etc. 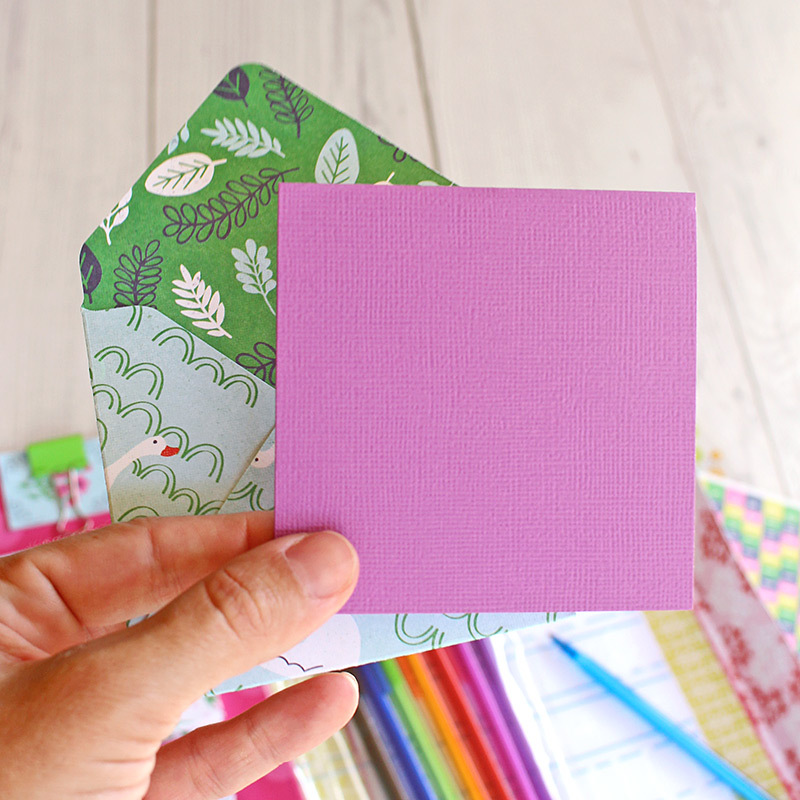 I’ve kept the cards small (89mm x 89mm or 3.5inch x 3.5 inch) this way, I can create four little envelopes from one sheet of 12×12 paper, as each envelope uses a 6×6 inch piece of paper. So many gorgeous colours and bold geometric prints in this collection! I especially love the macarons. You could pop a whole range of items in the box envelope. 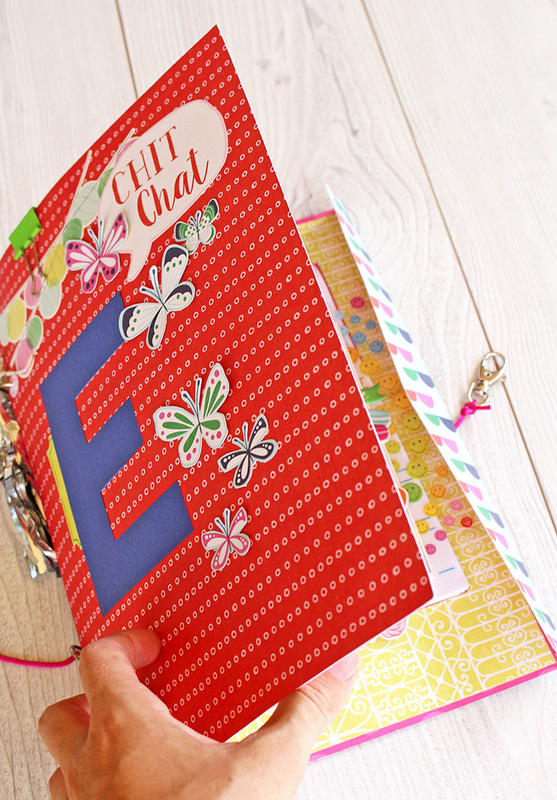 I’ve included some bright paperclips and some foil stickers from the ‘Oh Goodie’ range. 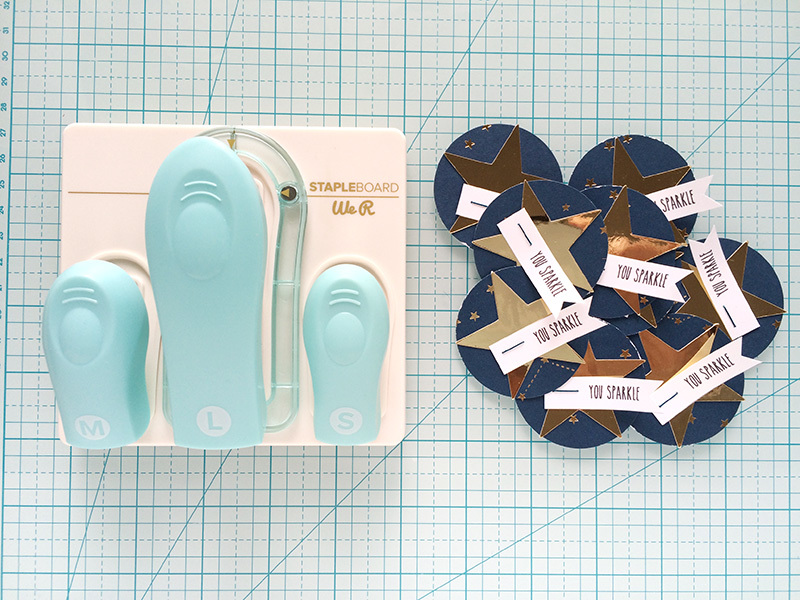 A peg glued on one side is very useful for holding some die cuts and a bulldog clip provides a strong grip for heavier items. On the opposite side, I’ve added the notepad with writing implements. One of my very clever fellow Design Team members, Amanda Coleman, shared an awesome idea to include pencils into a notebook she created. I’ve taken inspiration from that and used my Fuse Tool to create a sleeve for the pens. I’ve simply punched some holes in the sleeve and attached the pouch to the book ring. I’ve included this stencil as a loan! hehe. It’s actually a Heatwave stencil, so I will be on the lookout for a more permanent option to include in the folder 😉 By adding it to the rings, she can just flip it over when not in use. The little pad is just attached with some removable sticky dots. I’ve chosen these as it will be easy to replace the pad once it’s been used up. The pad has been framed with some more Flower Girl pattern paper. I think it looks so much nicer than just being adhered straight to the poster board. Needless to say, the folder was a massive hit! She couldn’t wait to look at all the details and give it a try straight away! 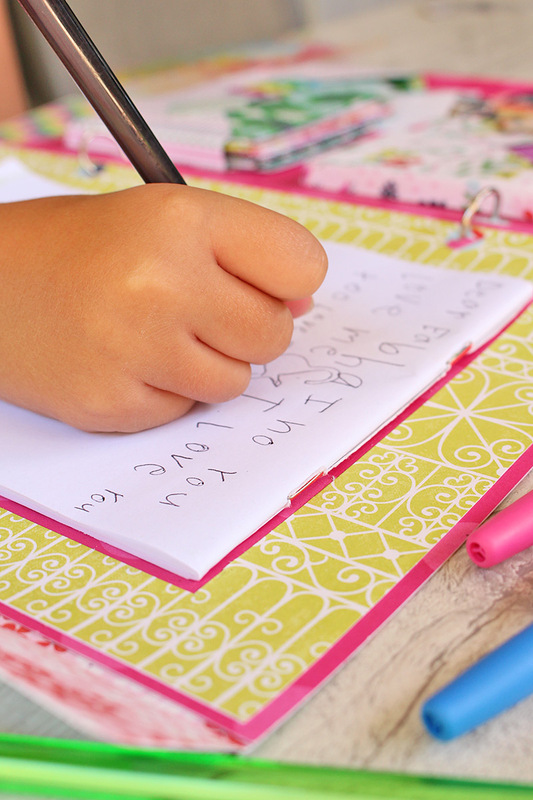 A note to her BFF… I couldn’t love that handwriting any more! 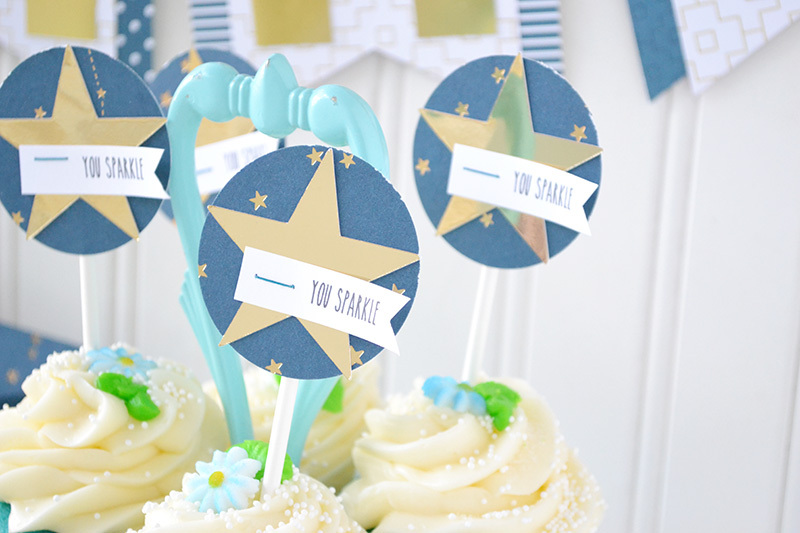 A cute card, decorated and filled with confetti which she punched herself using my DIY Party Confetti Punch. I hope you will give this idea a try. There are so many possibilities! 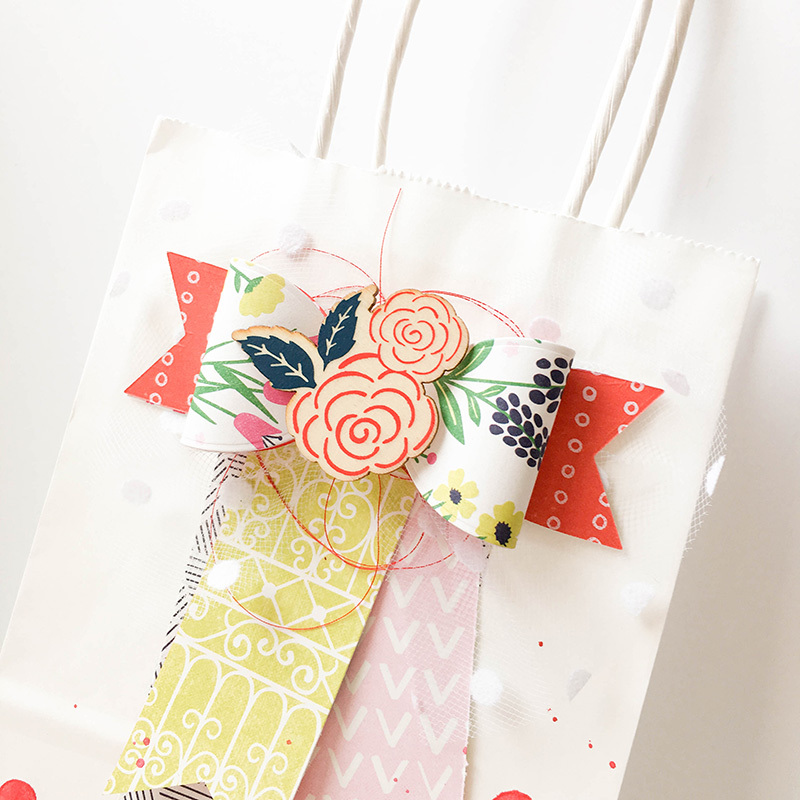 Adjust the size and/or contents and it could be such fun for a long journey or a thoughtful gift for a friend. 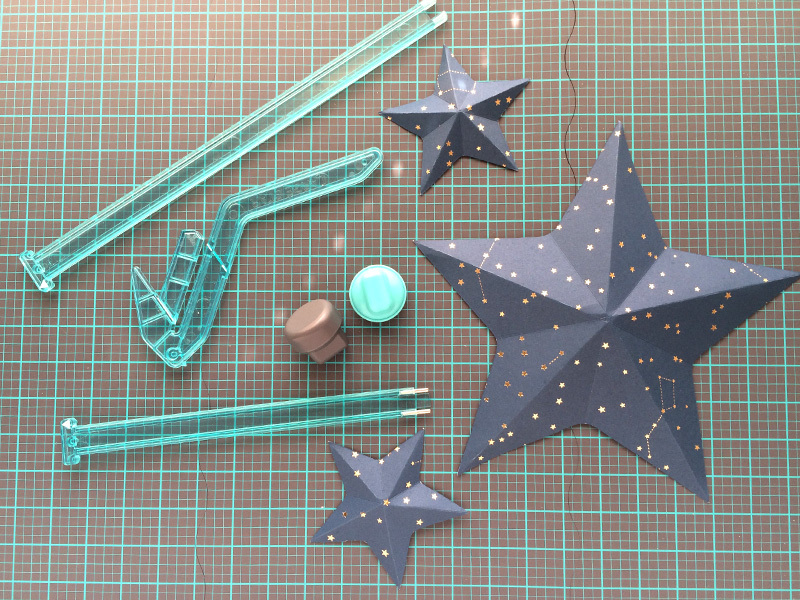 Until next time, wishing you lots of happy crafting! Hello We R Fans! 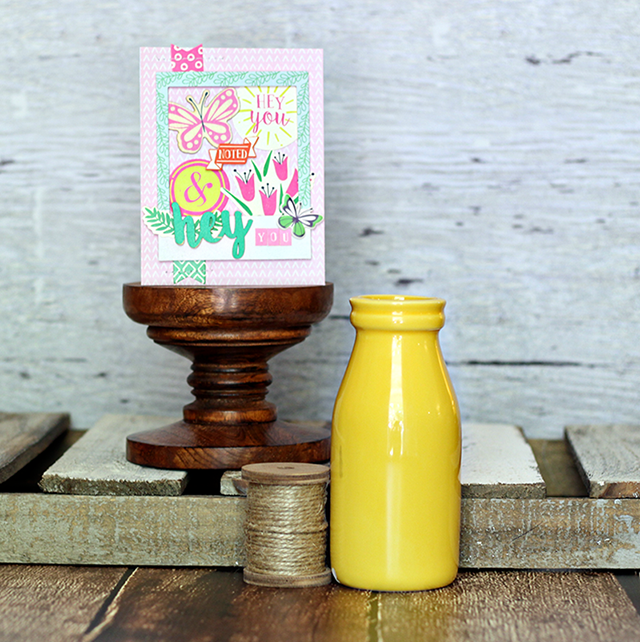 Kimberly Crawford here, with a card using the newest collection, Flower Girl. 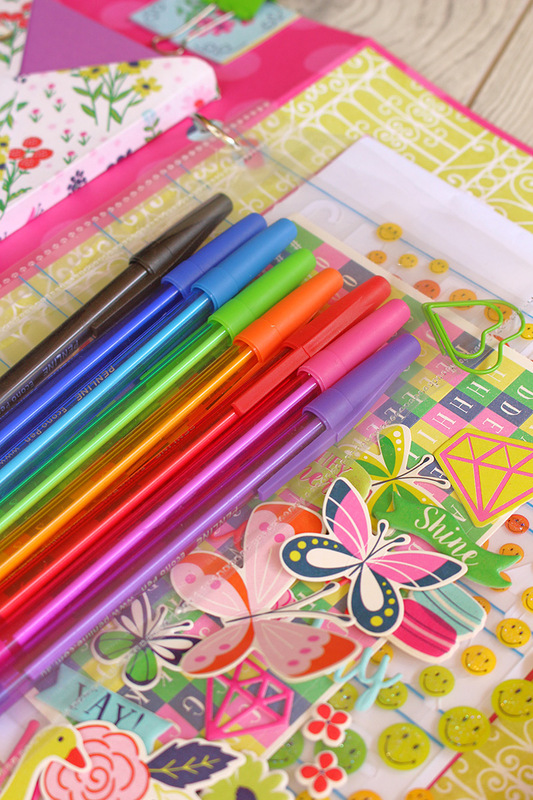 This collection is bright, fun, trendy, and I cannot wait to use every inch of it! The papers are so gorgeous, I want to frame them! 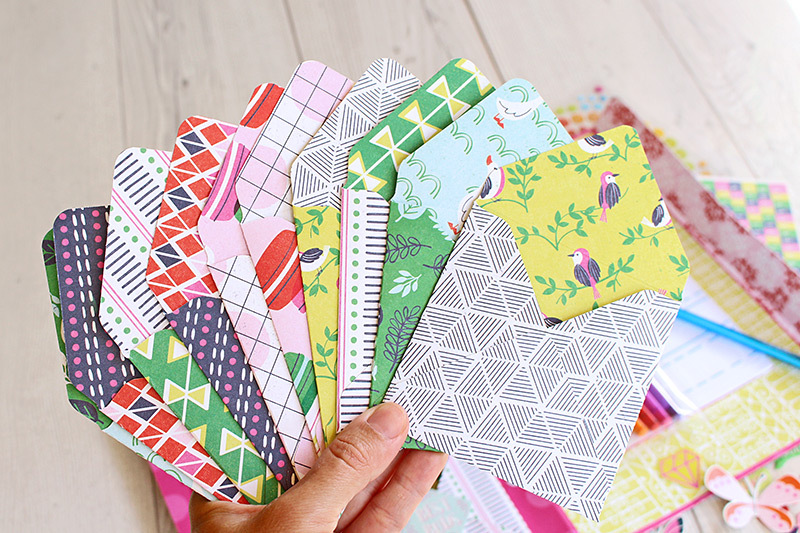 After layering a couple of patterned papers onto my card base, I found fantastic journaling cards on the Garden Gate paper. 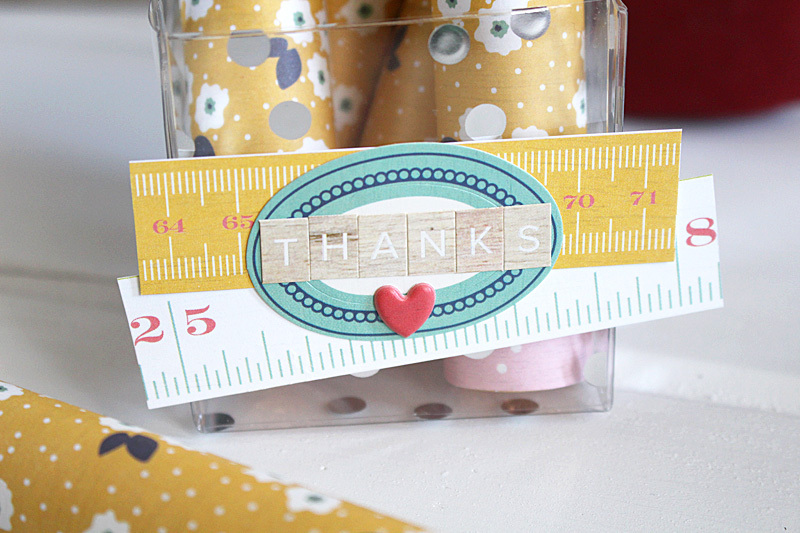 Measuring 4” x 4,” this one was the perfect sentiment for this card! 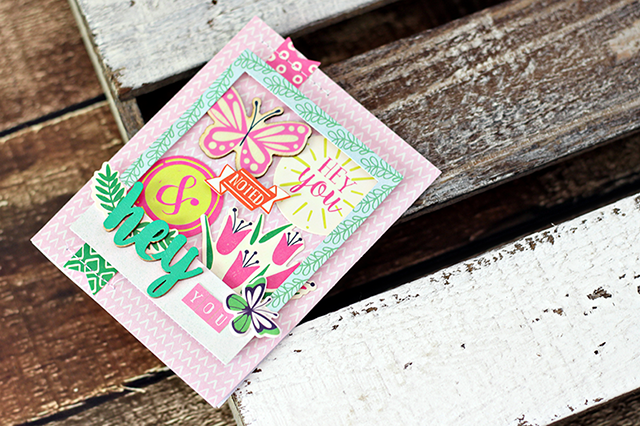 Over the journaling card, I added a frame from the Ephemera pack, along with a butterfly. On the bottom of the frame, I added two more pieces from the Ephemera pack. I like how the banner could tuck around the flowers, adding great dimension. My card measures a little over 5” square, so I needed to make my own envelope. Using the guide on the 1-2-3 Punch Board, I easily made the perfect sized envelope. The papers from Flower Girl made it coordinate beautifully. Using another piece from the Ephemera pack and a coordinating sticker from the Puffy Stickers pack, I made a seal for my envelope; the perfect finishing touch for my project. 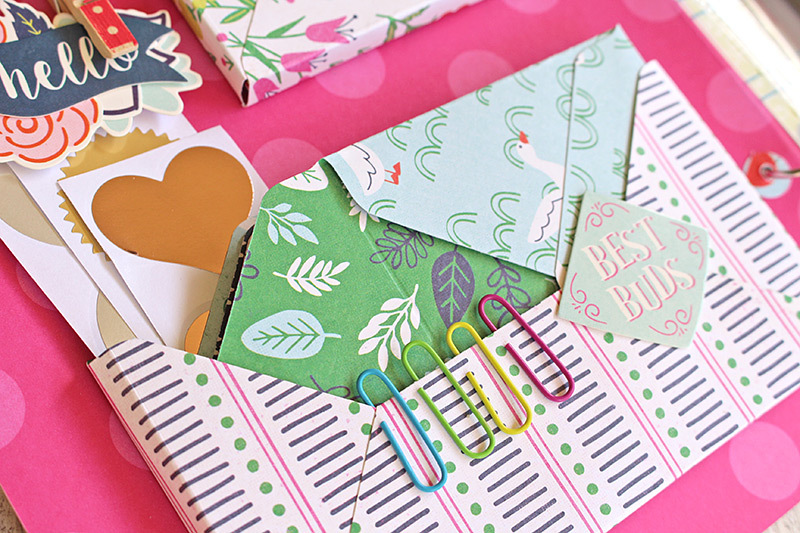 However, it will be the perfect way to open this special card for the recipient! 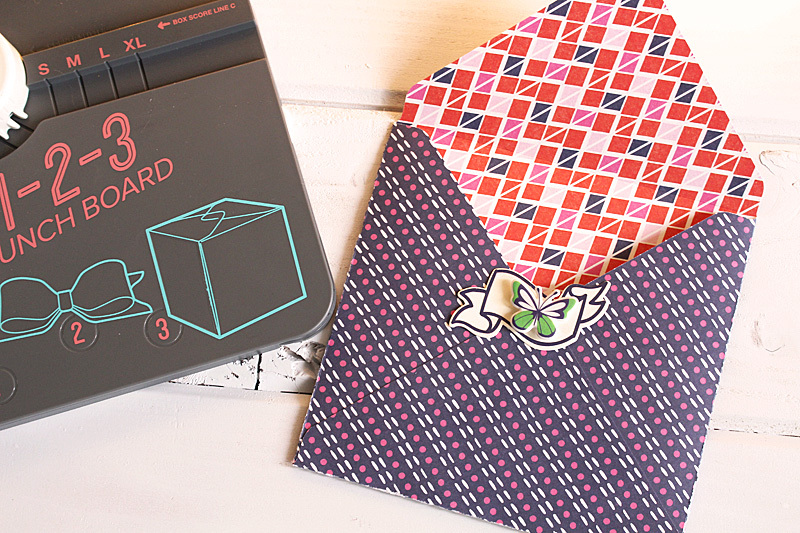 Who do you need to send a special card to today?